My daughters love my mom’s cinnamon buns. I rarely make them, as she always has them made about when I start thinking about it during the holiday season. Yet, I made them often enough when the girls were younger that I am confident and competent in the “how to’s” and make a mighty fine pan of yeasty cinnamon lusciousness if I do say so myself. I would like to say mom taught me, but she didn’t. Watching her make them so many times during my childhood let me give it a go so many years ago. Mom made bread. Not often, as she was a working mom, but often enough. Certainly, a few times a year and always at Christmas. 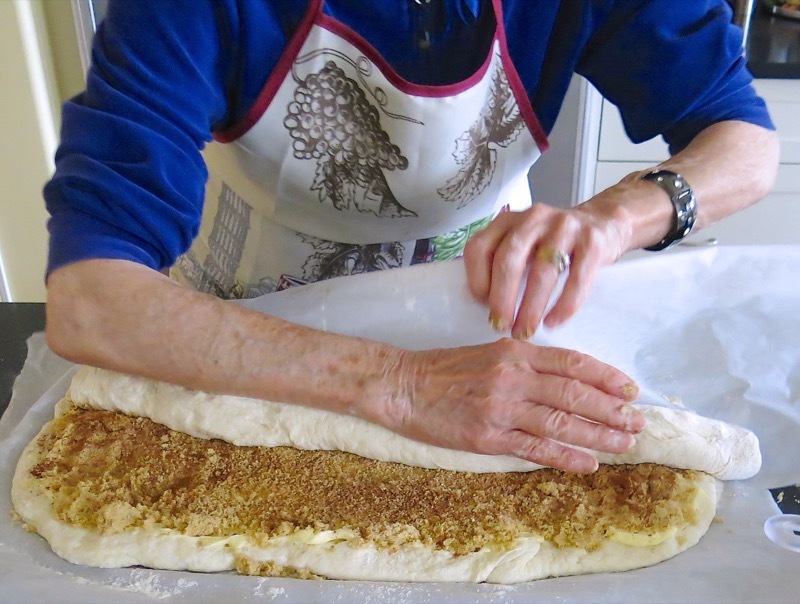 When she would knead a massive mound of dough, the last portion would be rolled into cinnamon buns. 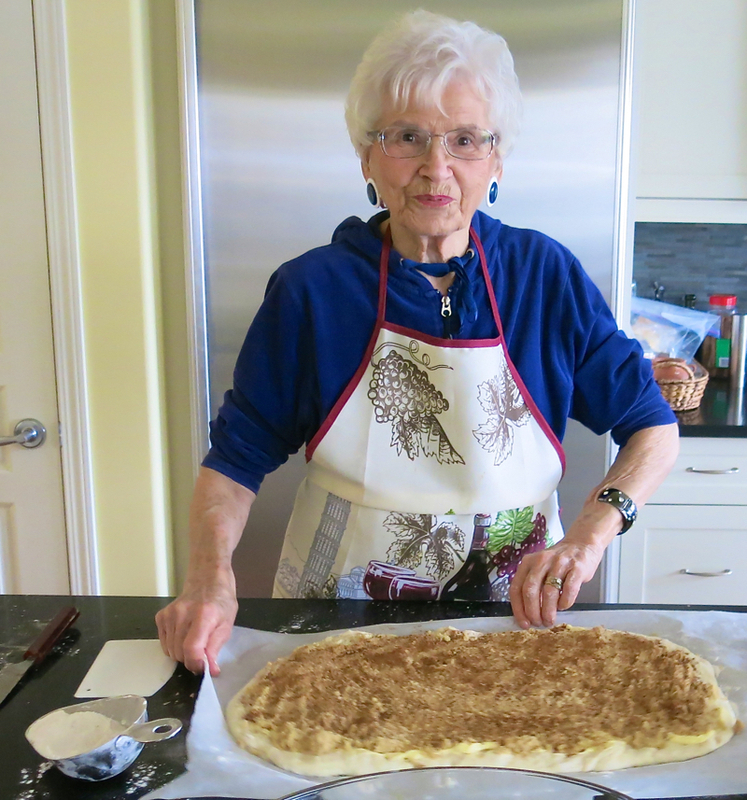 There might be loaves or buns, but there was always a tray of cinnamon buns in the mix. 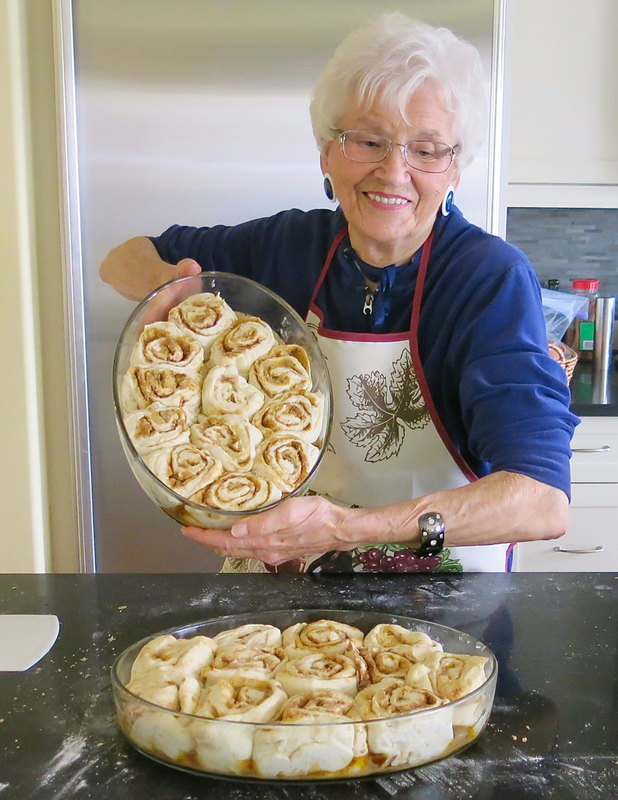 My mom’s cinnamon buns were absolutely the best in the neighbourhood. Hands down. To be honest, very few of the ladies even made them. 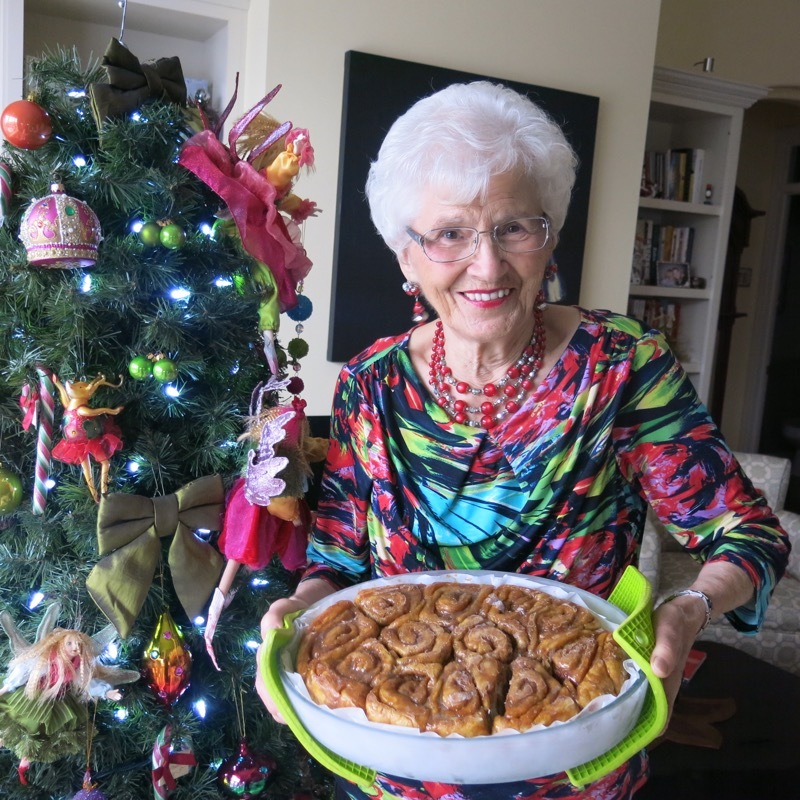 She made a beautiful dough, and before “sticky buns” were even heard of, she made cinnamon buns with so much goo at the bottom of the tray that it is actually possible she was the inventor of the “sticky bun”. 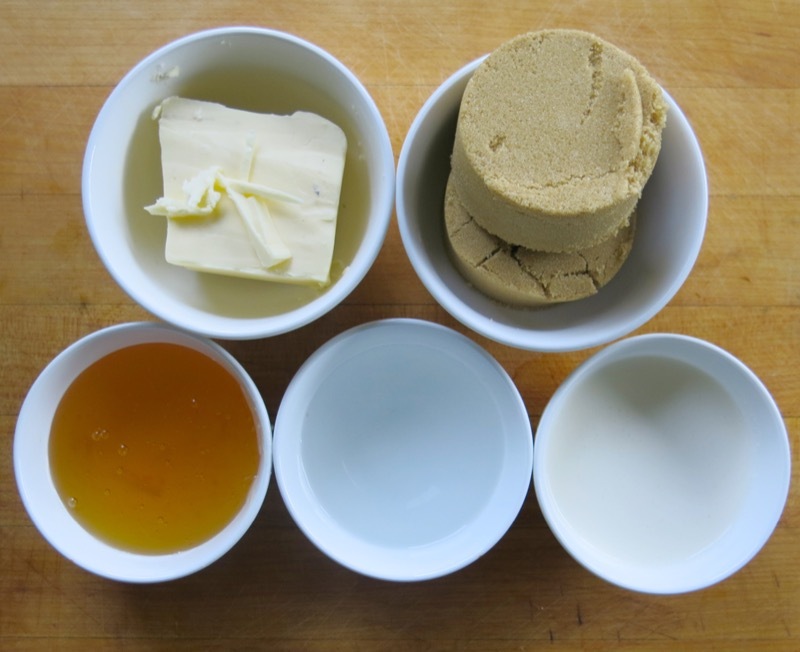 She would butter her tray liberally (thickly), sprinkle it with golden brown sugar (thickly) and nestle each bun onto that “waiting-to-caramelize-in-the-oven” mass. I did that, successfully, for years, too. Then she read about “goo”, concocted her own magic mix, and would make it up and pour it into the bottom of her baking pan. She has been doing this for the last 30 years, or so. 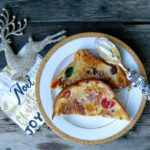 I am sharing her recipe with you, today. Mis en place, above, for mom’s goo. She uses golden corn syrup. I use honey. 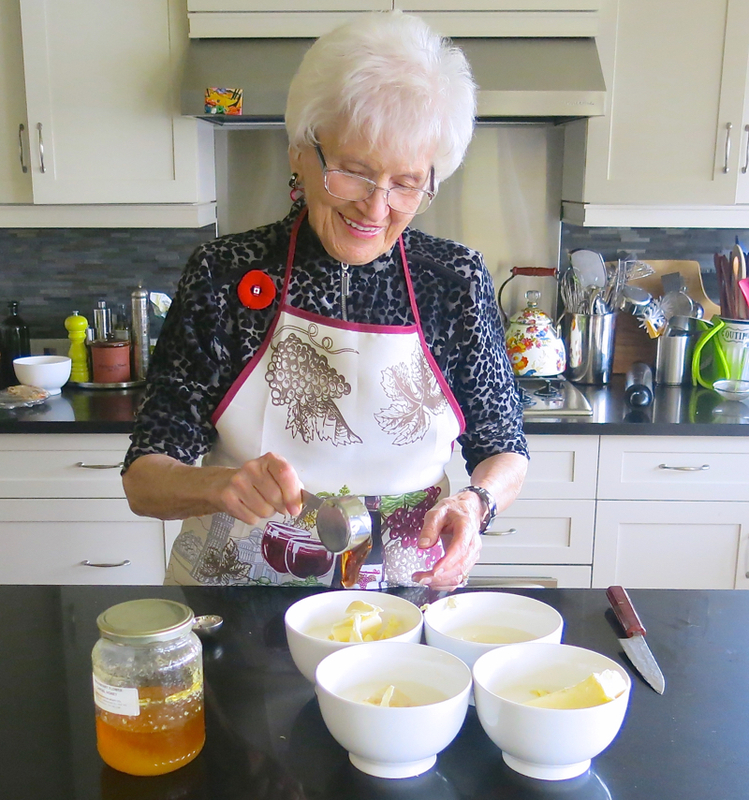 I choose natural whenever I can, though Grandma Maude’s Popcorn Cake and Butter Tarts are the only recipes that I use it in as both are iconic for our holiday table. If you have no idea what I am talking about, regarding the “evils of corn syrup” or GMO corn, in general, just read Michael Pollan’s The Omnivor’s Dilemma. When mom and I bake together, or alone, it is no different. We never make one of anything. Today, we are making 4 batches of cinnamon buns, thus preparing 4 batches of goo, above. All into a heavy saucepan, brought to a low rolling boil for 3-4 minutes, then into the bottom of the baking pan. We made the good while the bread was proofing. 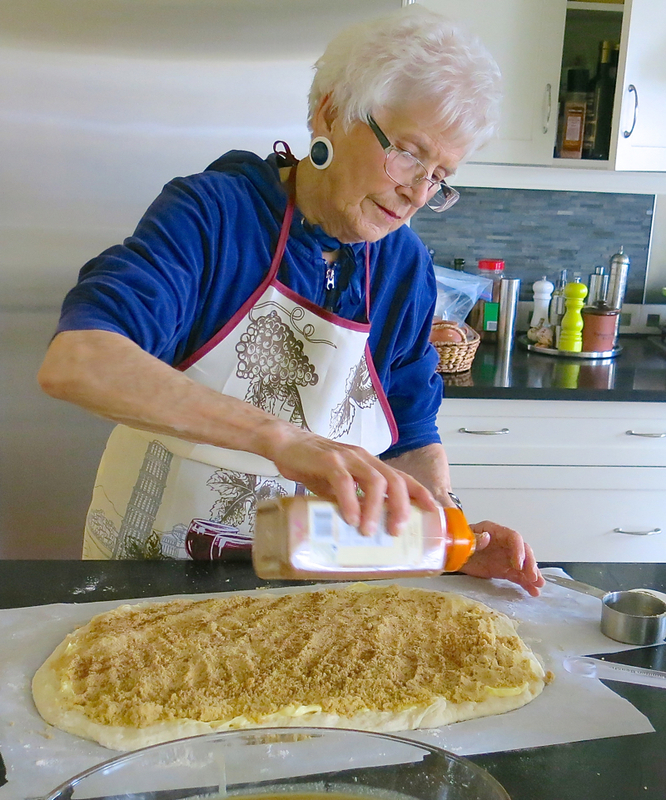 Mom uses the same dough to make the cinnamon buns that she used to make her famous Canadian Prairie Dinner Buns. 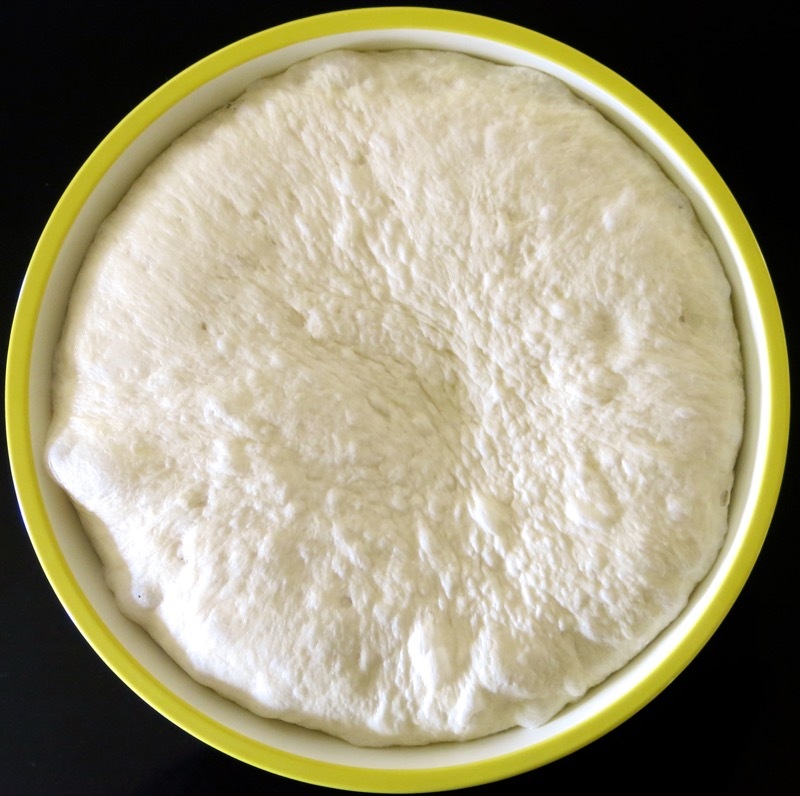 All instructions and the recipe for the dough are here. Dough proofed, and ready to roll! 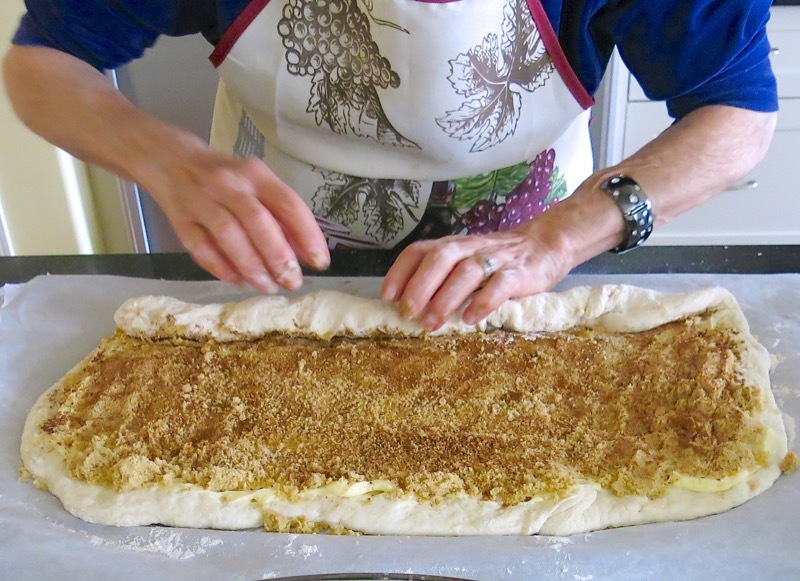 Placing the dough on well-floured parchment helps with the rolling process, and contains the mess. 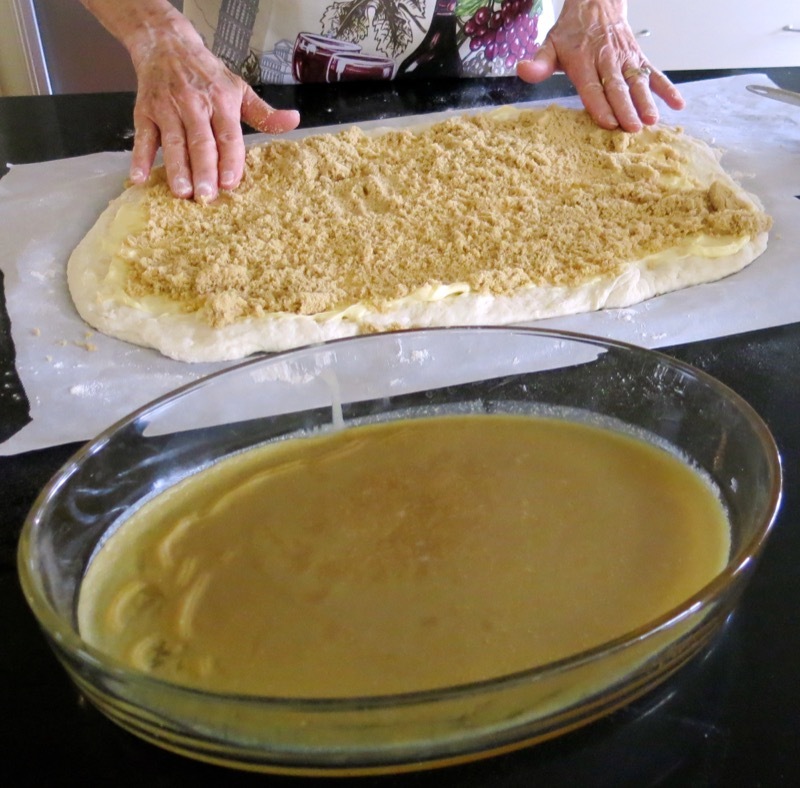 Mom ensures there is plenty of flour under the dough while gently patting it out into a rectangle shape, above. She’s happy with the thickness and size of her dough, above. Done. Now, for the butter. Why no mis en place for the filling? “I don’t measure what I do. Never have!” But, I did watch and measure, so the ingredient amounts mom used are included in the recipe. 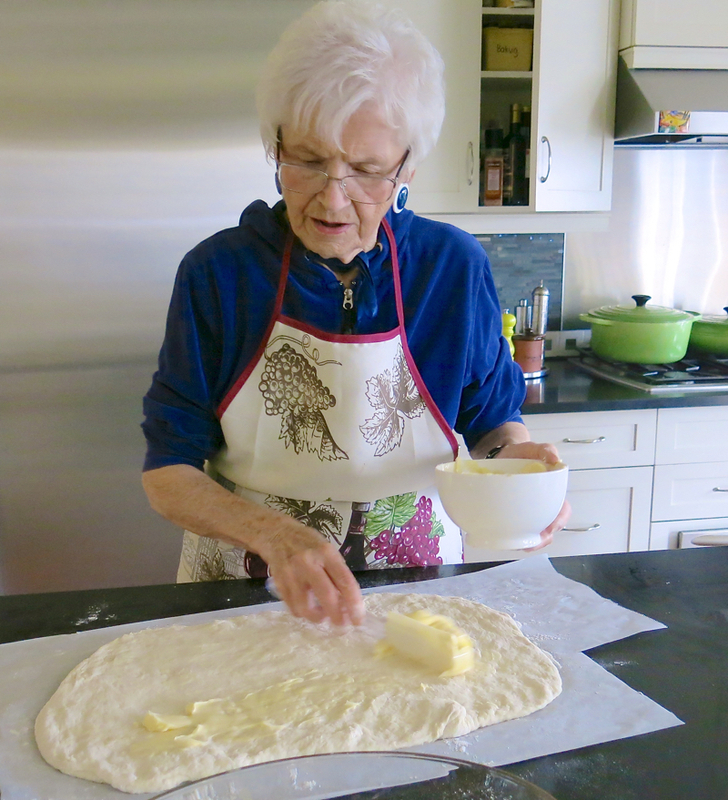 She used almost a whole cup of butter, but went back and “evened it out”, so a good 3/4 cup was generously slathered over the supple dough. This was followed by a packed cup of brown sugar. She used the entire cup and it was the “perfect amount”. We had the Christmas music on and were definitely enjoying ourselves, but I am certainly better at photographing food than someone making the food. I must have closed the door behind mom so many times, but clearly, I never noticed it was opened, or so many other details I can clearly see now. Yet, hey! This is the reality of cooking in the kitchen, right? 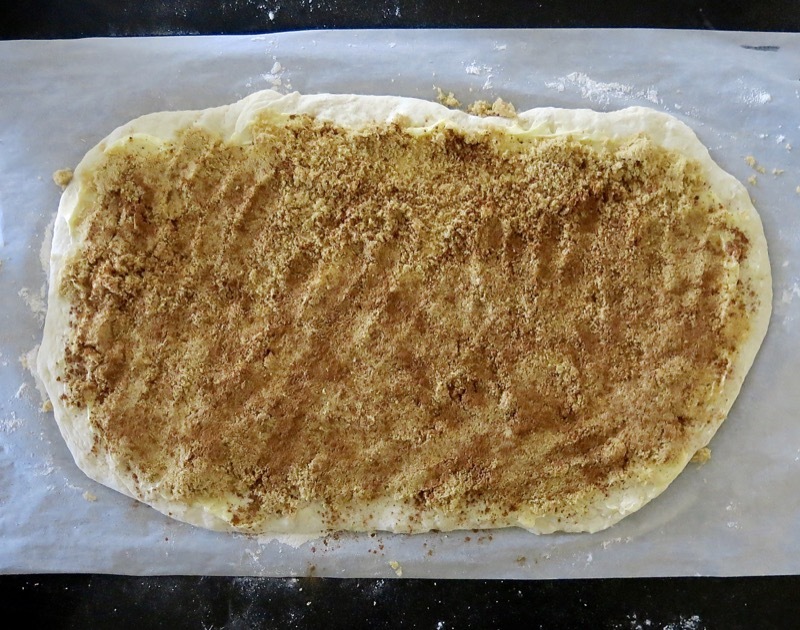 Above is what the dough looks like with the amount of cinnamon mom used. And now she’s ready to rock and roll! 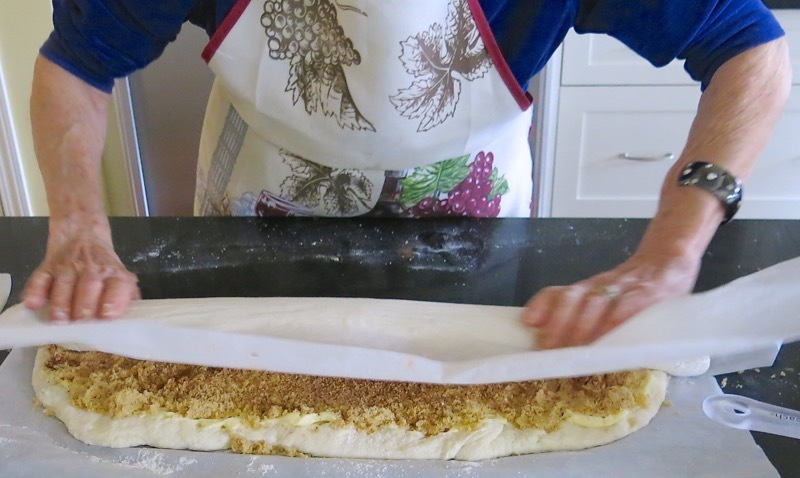 Lifting the parchment enables the dough to roll over upon itself. Look closely, above left. Do you see the long bit hanging over the end of the mass on the right side of the image? 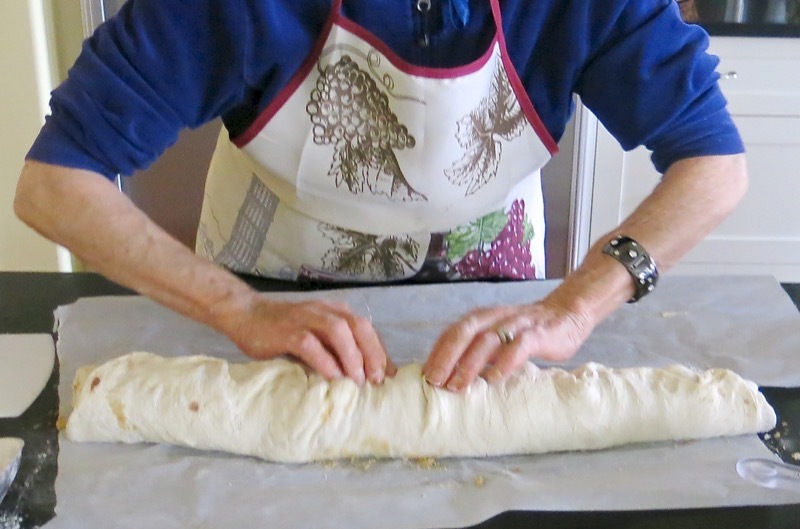 Yet, above right, you can see mom has pulled the dough under that long bit so that it will now roll over onto something. 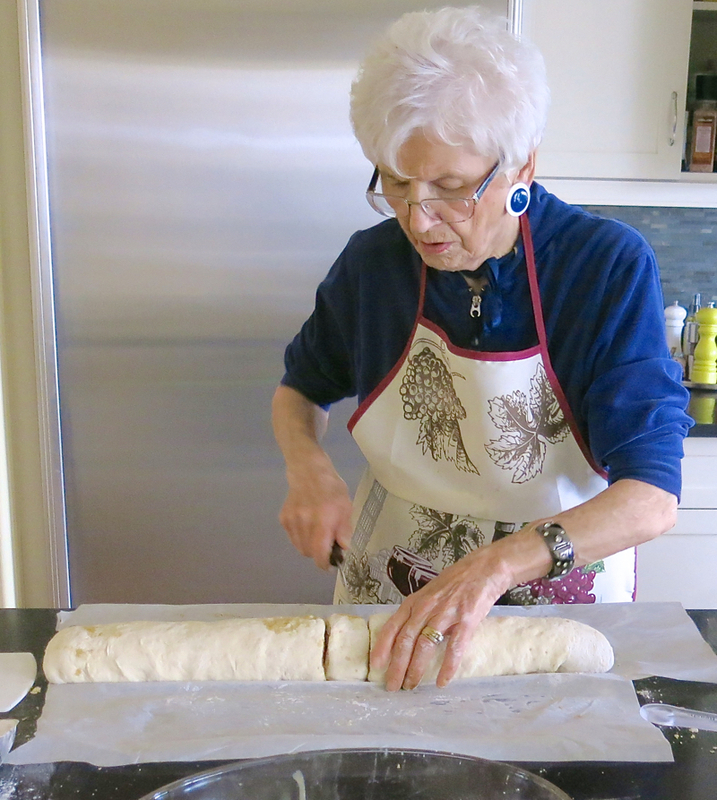 She is adjusting the alignment of the dough at the other end in that same image. It isn’t really “all that technical”. It is just common sense, really. Yet, if you are new to baking, hopefully good tips for you. 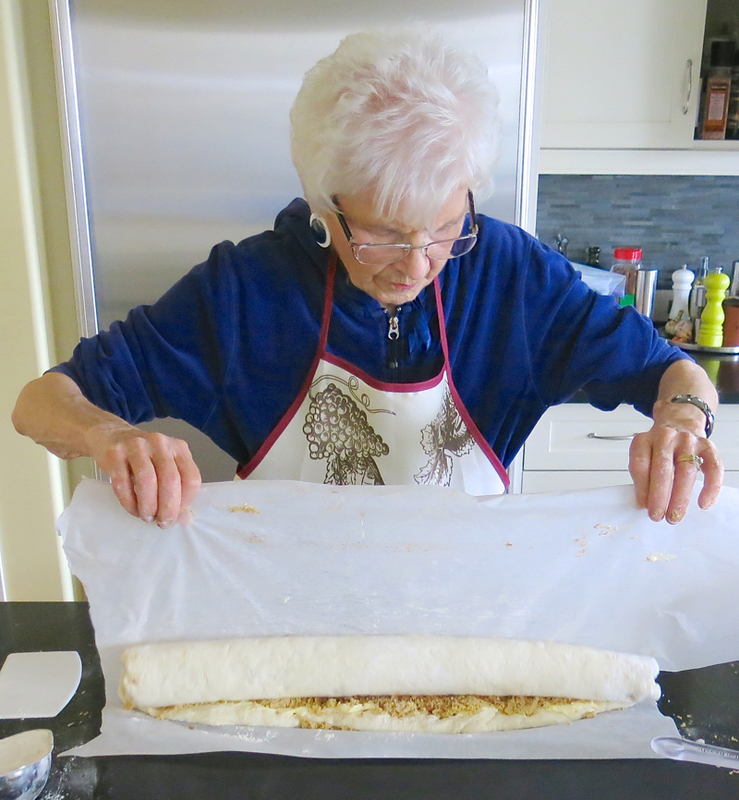 Above, she is lifting the parchment, getting ready to guide the dough to its finished roll. I am always surprised by the stronghold she takes to the dough. She pulls it up and around the log with confident vigor and pinches it securely in place to ensure it will not open. 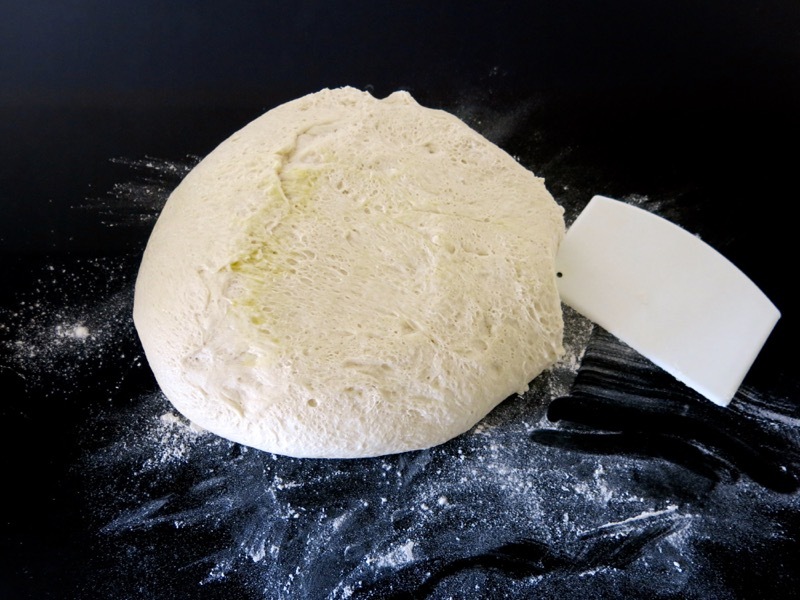 I usually worry about pulling the dough this thin, and just roll it over onto itself, seam side down, and start slicing. Yet, this is mom’s technique and it makes beautiful buns. What a gorgeous length of the dough. She took a moment before she started slicing to determine the middle, and to decide how wide to slice each portion, then estimated the total. There would be 14 large buns in this recipe. Twelve large slices fit into the large oval pan, and we filled prepared pie plates with the leftover slices! Onto the goo each slice went, and at 86 (87 in April), she still knows how to portion her pan: one at each end! When plopping them into the pan, the prettiest side goes down into the goo. Why? The pan of buns gets baked and then after cooling a bit, inverted so that the goo is on the top. Thus, the prettiest end of the slice goes down into the goo. Ready for the oven, with more to make! Gorgeous! Knowing your oven is important when baking cinnamon buns as it is not the same as baking bread. With bread, the hottest oven possible is best. 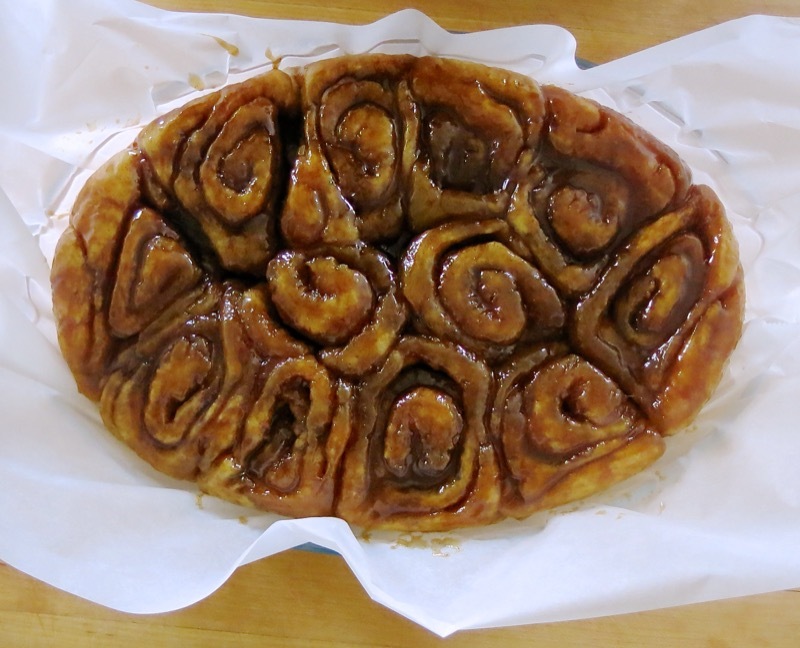 With cinnamon buns, the oven temperature is much lower and the baking time longer to ensure a full bake through to the middle of the gooey mass. Are these not gorgeous? 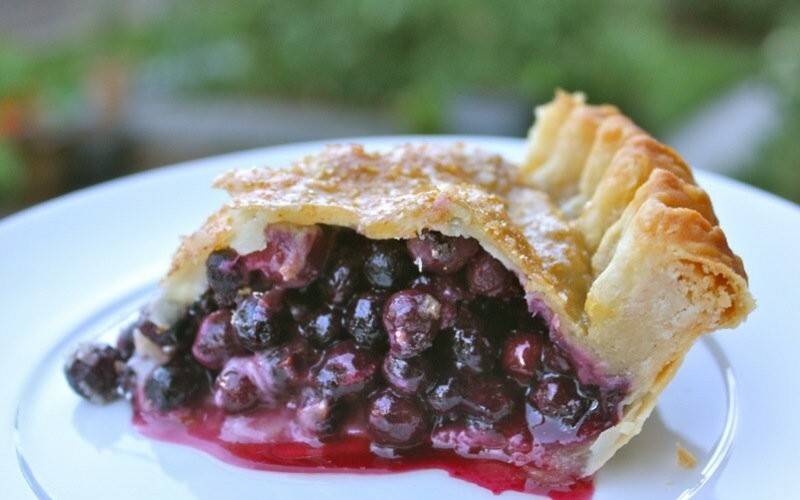 Recall that the prettiest end of the slice went into the goo? After cooling these a bit, it is important to remove them from the pan while still warm enough to do without anything sticking to the pan. If serving the buns hot out of the oven, I flip them onto a serving tray and present with a resounding, “Ta-da!” But, usually, I freeze them as I make them in advance on a baking day. So, I flip them onto a piece of parchment paper. Wash the dish they were baked in, and then set them back into that dish. Above, you can see the outline of the dish through the parchment paper. I then trim the paper to be the same height as the dish, cover all securely and well with plastic wrap, then freeze. Once frozen, if I need the dish, I just remove them and rewrap place them back into the freezer. 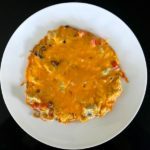 Best served warm, and heating on a plate individually in the microwave, or the entire pan in the oven on low is well worth the wait. They are already laden with such deliciousness, that they really need nothing else, but why do we heat them? Butter! Yes! Melted into the soft fleshy dough, there are no words. Mom’s legacy will be known for generations to come. 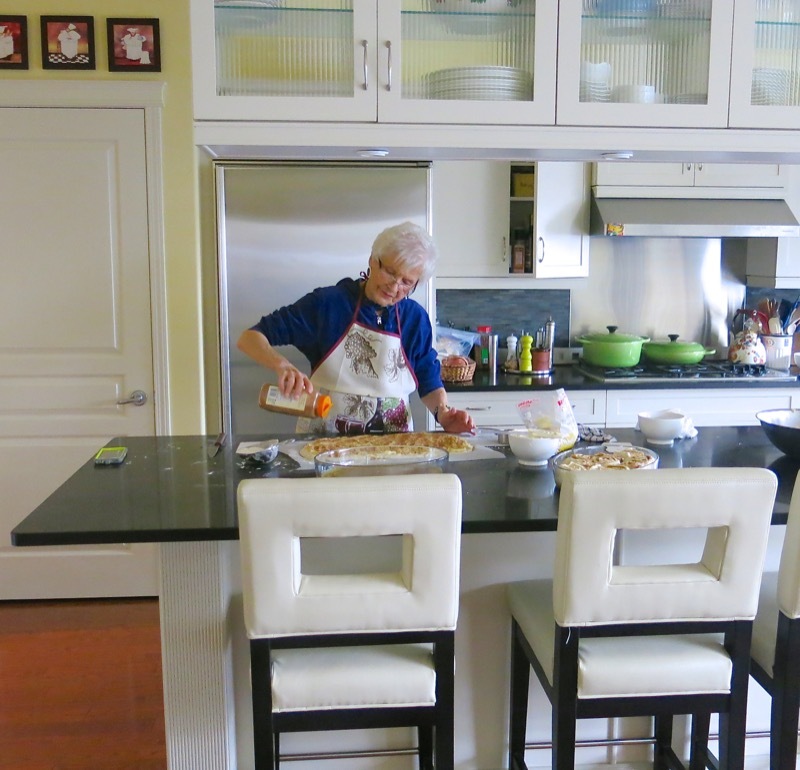 I am so fortunate to have had such wonderful experiences in the kitchen with my mom and as she is an incredible role model who motivated me to achieve excellence in all I undertake in my home kitchen. My children revere her and make her recipes. 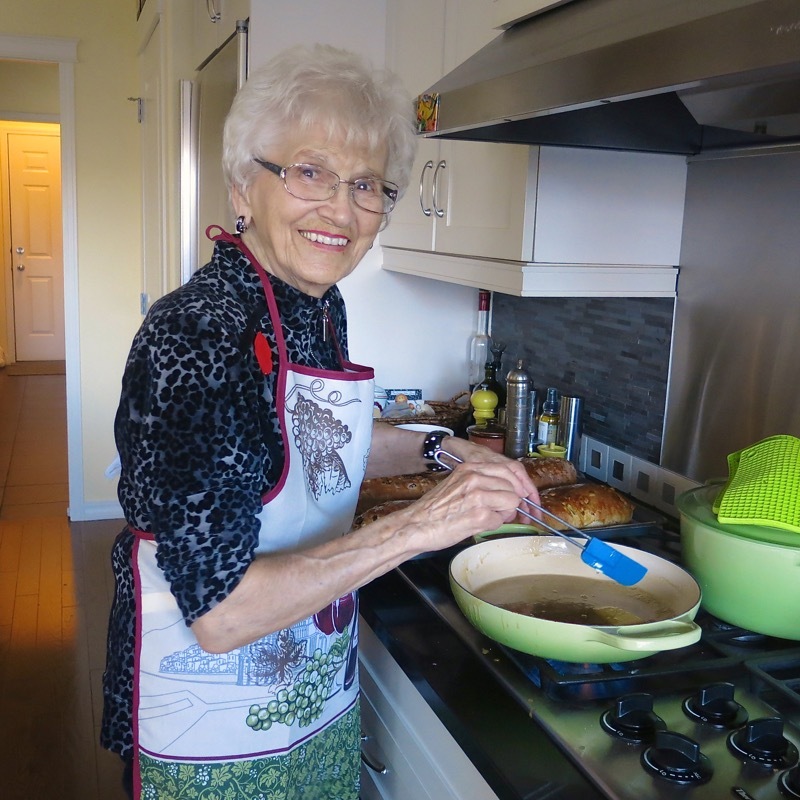 I am fortunate to be able to record some of these experiences and capture some of these stories as they will be told to her great-grandchildren, and their children, and theirs. The food is that good, the stories are that interesting, and the grandchildren’s love for their grandma is that powerful. With these 3 elements in place, only magic can happen. 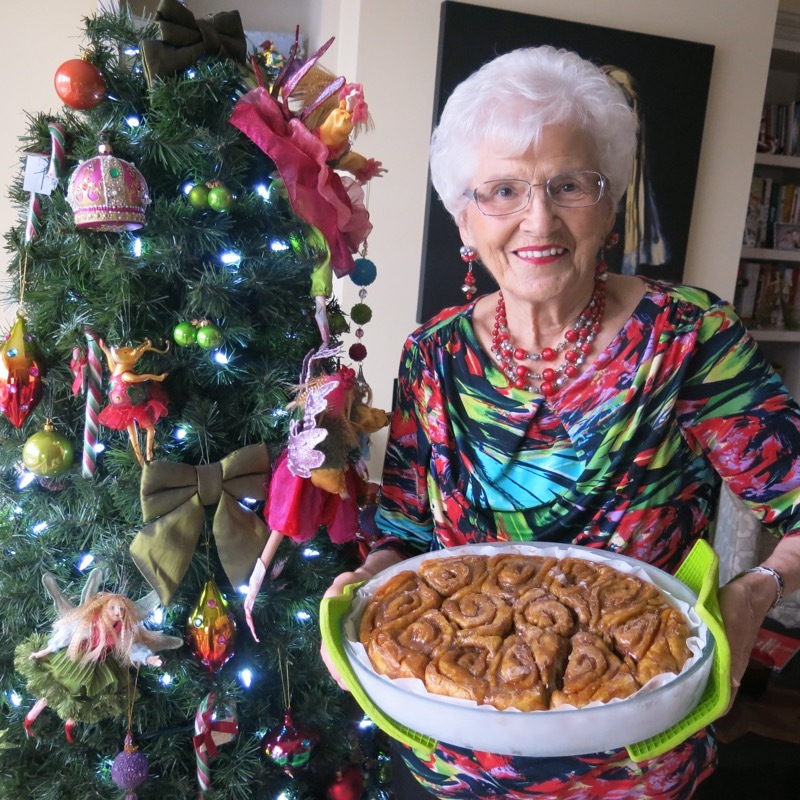 Helen's Cinnamon Buns are famous in our family, our neighbourhood and our home town. No one makes them better. 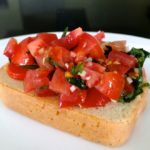 You will love this simple recipe. Not nutritious, but outrageously delicious. 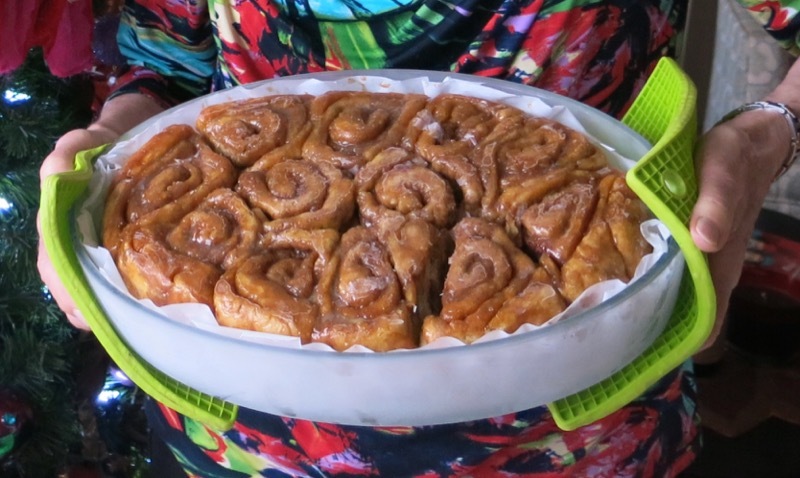 I never make one batch at a time of cinnamon buns, thus, I always double this recipe and divide it into two 10x12 pyrex pans. It is easier to make in a bigger batch. 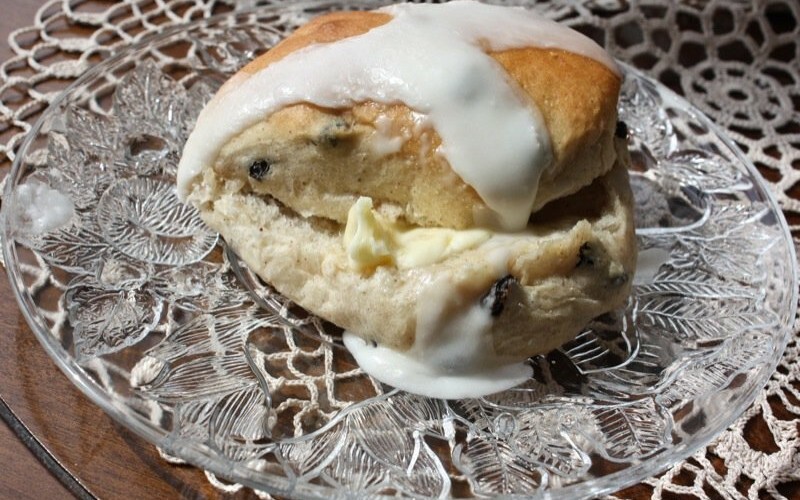 It is critical to ensure the centre buns bake to 197C so they don't sink which is a common problem. As every oven is different, a lower temperature and a longer bake time is the solution to this. You will have to experiment with your oven if this happens to you. For me, 350 for 28-30 minutes works well, and I do have to cover the top with heavy foil to avoid over browning the past 10 minutes. Aaaaanhhh! Just the photo of pinching the end of the roll to the body takes me back. 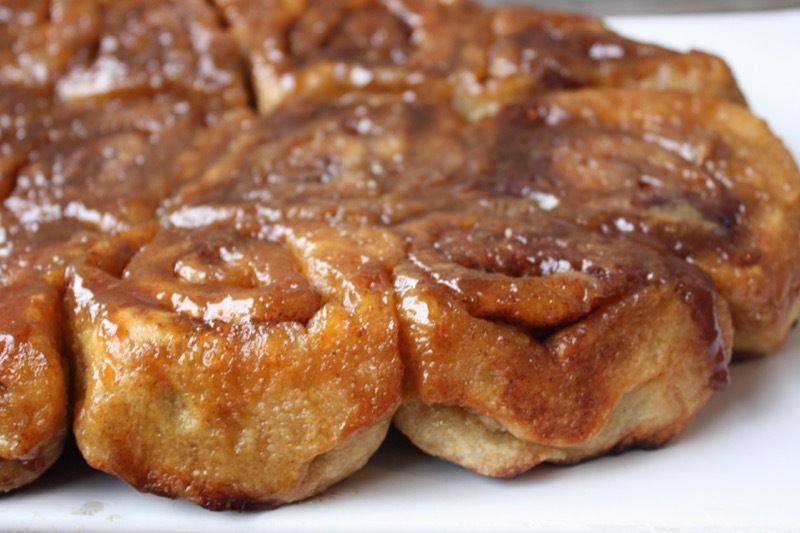 Our cinnamon buns were made with regular bread dough. 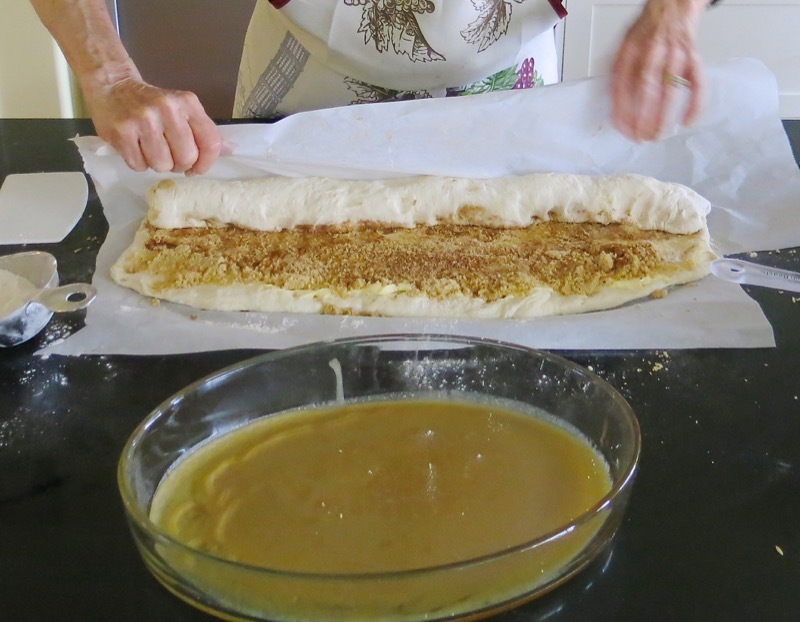 The butter was melted, and poured onto the flat slab of doubh, then the brown sugar spread about on it before the cinnamon was sprinkled — I don’t think we actually measured. We just hsook and shook and shook the cinnamon bottle!!! And then sometimes there were raisins added (pre-plumped and drained), perhaps even some walnuts. As soon as I saw “cinnamon buns” I remembered our first step: boiling the string, which was used instead of a knife. 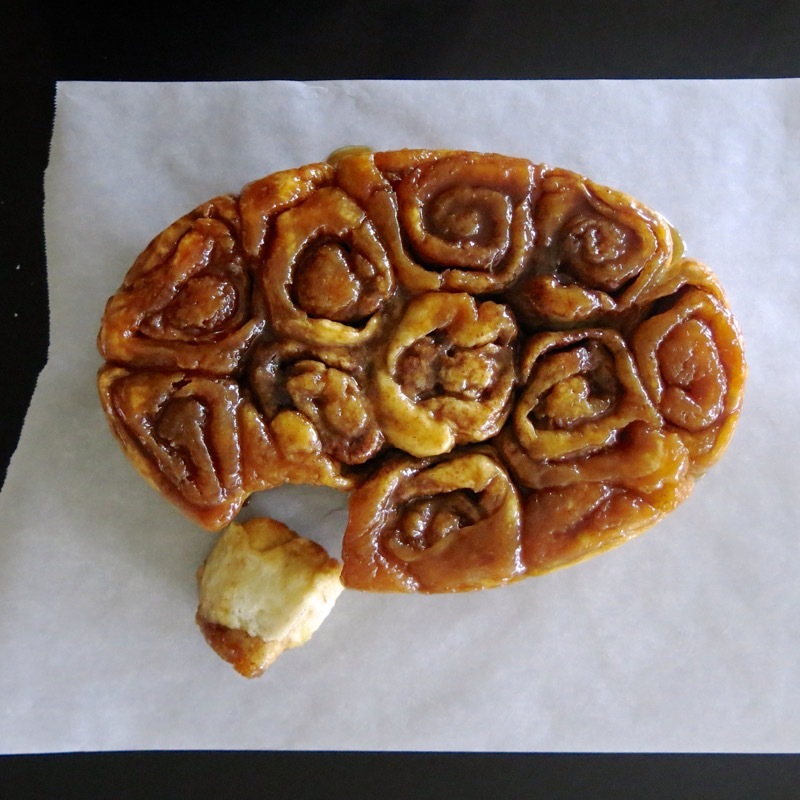 A knife, even a sharp one, messes with the perfectly round, even symmetry of the Perfect Cinnamon Bun, I was told. 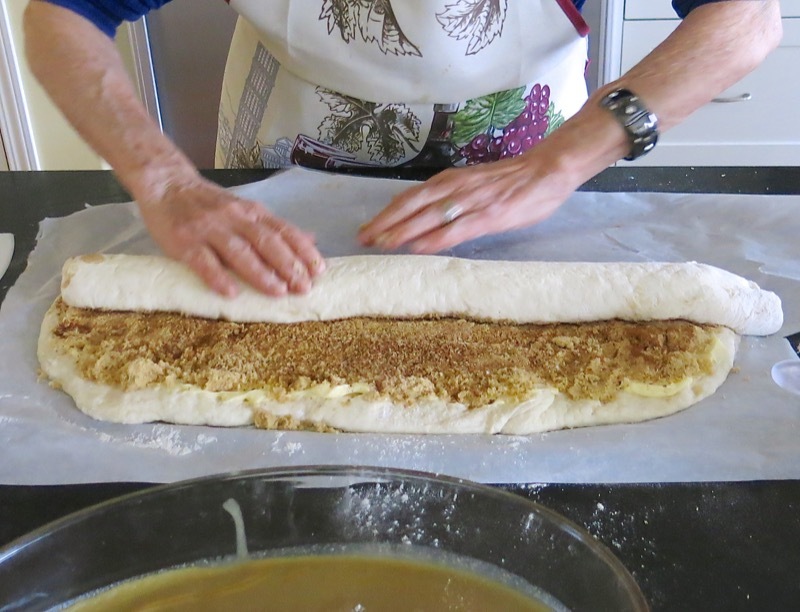 So you slip the thread under the end of the rolled up log-of-buns, position it where the cut is desired, then cross the thread over gently, pinching the about-to-be-separated roll in between the threads, pinching them right off. They always come out perfectly shaped! The first time I saw cinnamon rolls without all the ooey-gooe4y-sticky-goodatuff, I refused to believe what was being offered was actually cinnamon rolls. 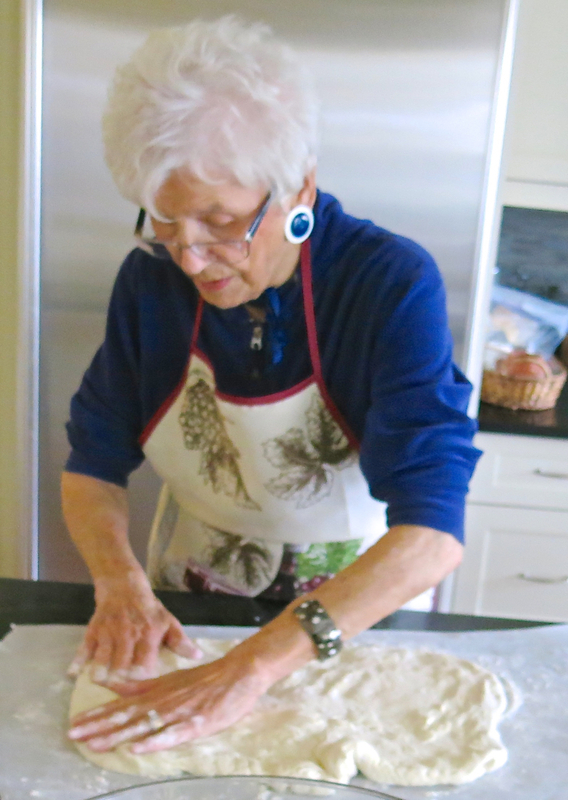 When I think of my mom, the first image that pops into mind is her standing in the kitchen, bread pan on the stool at a good height for kneading, hands dripping with bread dough, shovelling in flour and in the memory clip that I love, brushes back hair with the back of her hand, leaving a smudge of flour on her cheek. 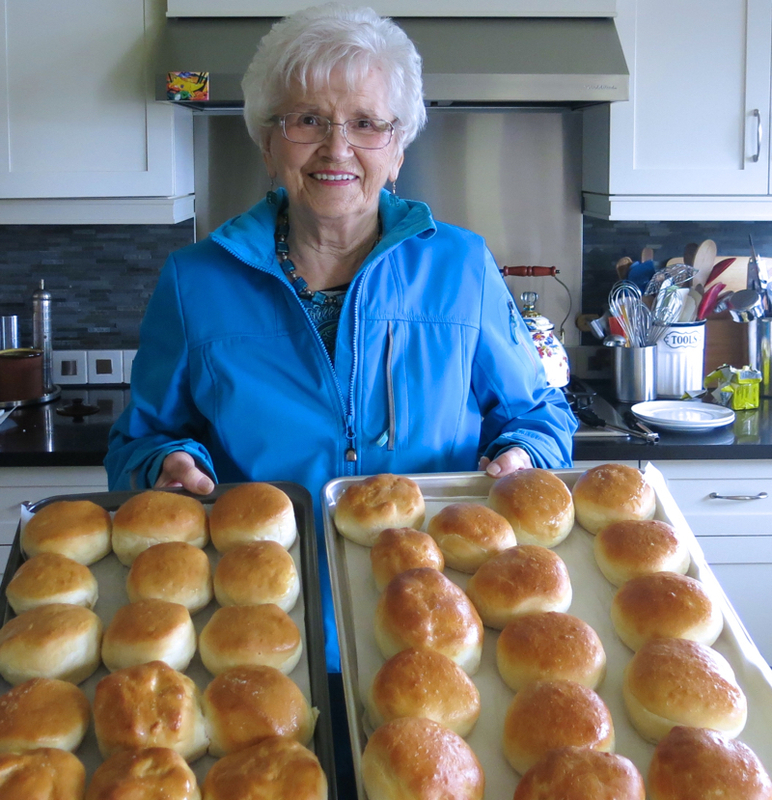 She made 10 loaves of bread (2 oven-loads) and two pans of buns (sometimes one of cinnamon rolls) twice a week. It took a whole loaf just for kids’ school lunches each day! How your mother was a workhorse. Few women in this country these days would survive that pace. I loved hard work when I was young and healthy, and my mother still has that kind of stamina, almost! Ha! I have not heard of the thread or string with cinnamon buns! I will most definitely try it next batch. I do have a wonderful very sharp Japanese knife that is brilliant, but I do recall sawing through the dough being very tedious and worrisome in the past. Love this idea. Thank you! That image of your mom is so endearing. Seriously, endearing. I can imagine her, too, through your eyes. What heroes raised us, eh? A homemade loaf for the day’s lunches puts that forgotten past into such perspective. When we had to grow our food, preserve it, bake it and make it. Buying was cost prohibitive such a waste. It gave life such purpose, such a sense of deep primordial satisfaction and most definitely all had a sense of what it really took to get that food on the family table every night. Waste? I don’t think so! Oh, I could go on… Hugs to you… and, I’ve blown a kiss to your mom! I’m just trying these out today with my 15 year old daughter…Normally when I make bread I use my Kitchen aid mixer for all of the kneading processes, but this time I followed your mother’s recipe and did the kneading by hand as stipulated…I had her help so she knew how to do it properly . Anxiously waiting for the end result..I’m adding pecans to the “goo” 🙂 Thank you for the recipe. Ohhh! Pecans! Yummy! I am not a gal that likes nuts in my cinnamon buns but I can appreciate the idea! Love pecans! Let me know how it goes. 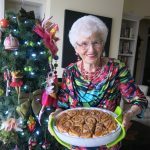 love this post Valerie, your Mom is beautiful and the cinnamon buns look just like my Grandma made. Isn’t that something, Laureen? I love how you have those memories, too! 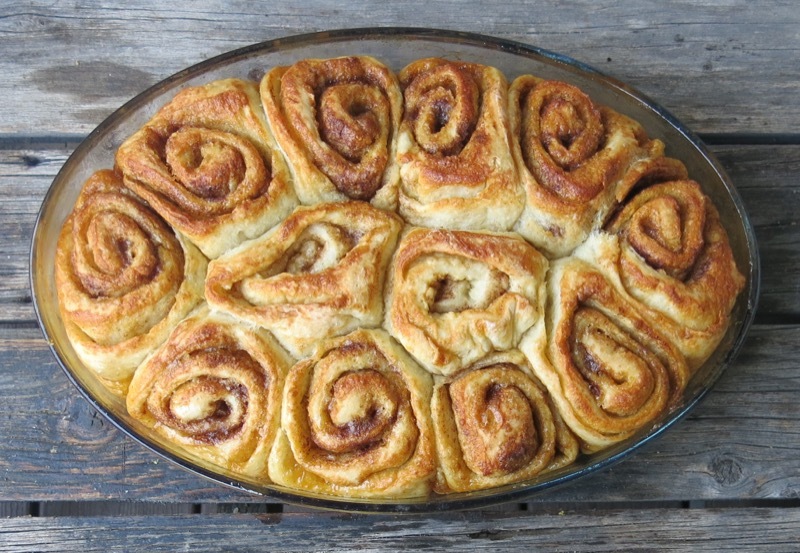 Yet, today, I have not seen anyone’s homemade cinnamon buns look like these. Usually, they have icing or something or not the gooey goodness. I still hope to see you soon!!! Let me know how they turn out, Wendy! 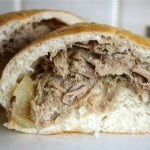 Did you make the scuffles recipe? Wonderful! Right side out, I hope! Not like me! Hahahaha! But, they are delicious either way, that I can attest to…. if you did make them, it would be so appreciated (gutsy of me, I know) if you would make a comment on that post so that Liz could see it. I am really trying to get some family favourites up this year. Usually I get the recipes made, the photos taken and then it is February before I know it! Merry Christmas and warm cozy love by the fire for you and yours! Valerie, I still make these, exactly the same way as my dad taught me, so similar to your mom’s recipe. Dad almost always added raisins and sometimes a chopped apple. 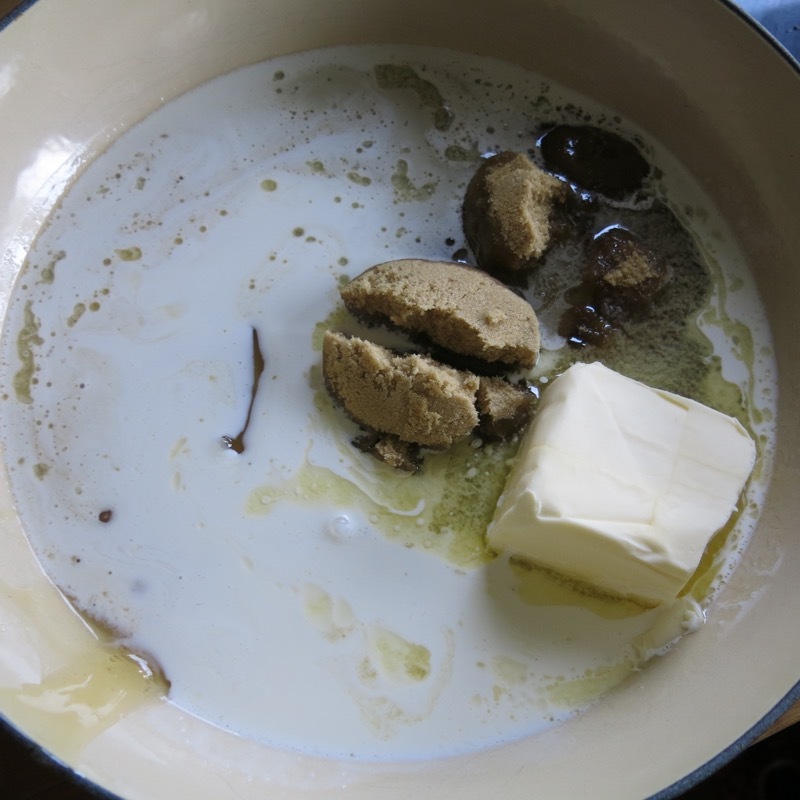 Generously butter the pan, add a layer of dark brown sugar and some cinnamon. 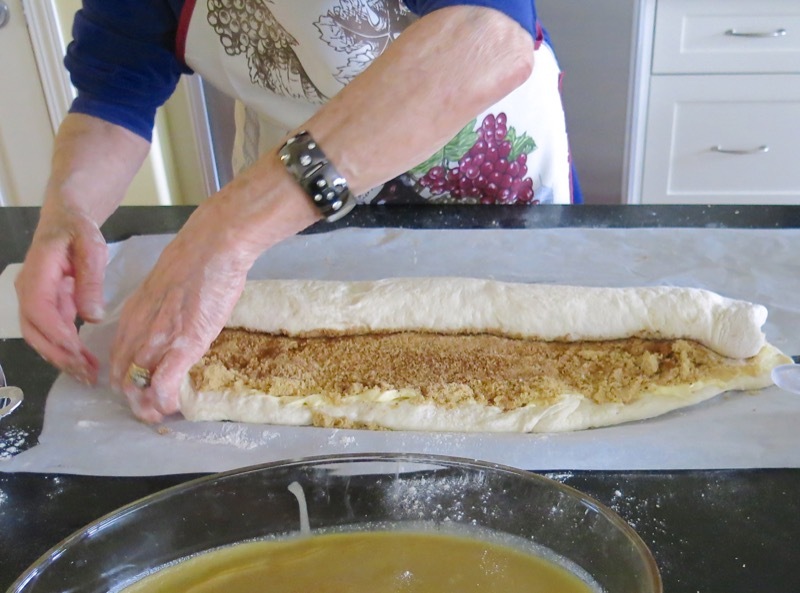 More cinnamon swirling through the middle of the roll with the butter, brown sugar and raisins. We would wake to the scent of cinnamon buns baking on Saturday mornings and knew that dad wanted us to get up and play. 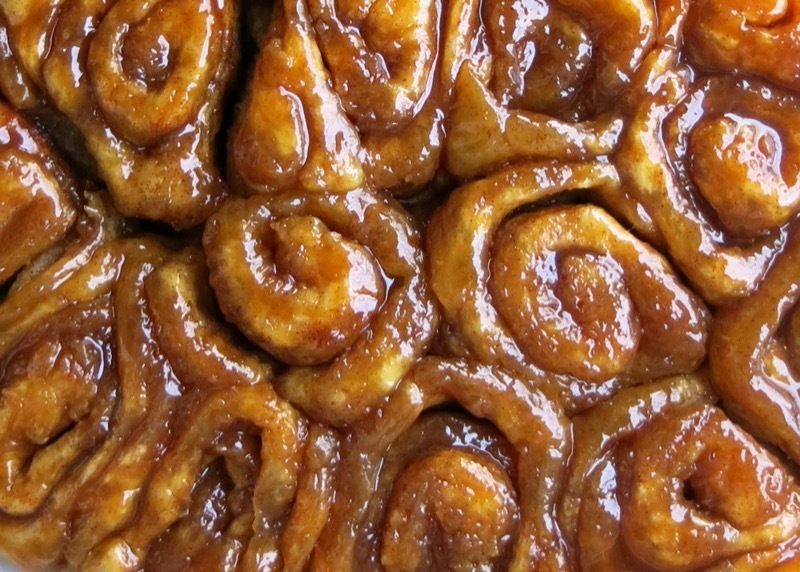 That is one of my treasured memories of childhood and the scent of fresh cinnamon buns will evoke it so easily, bringing a smile and a tear together. 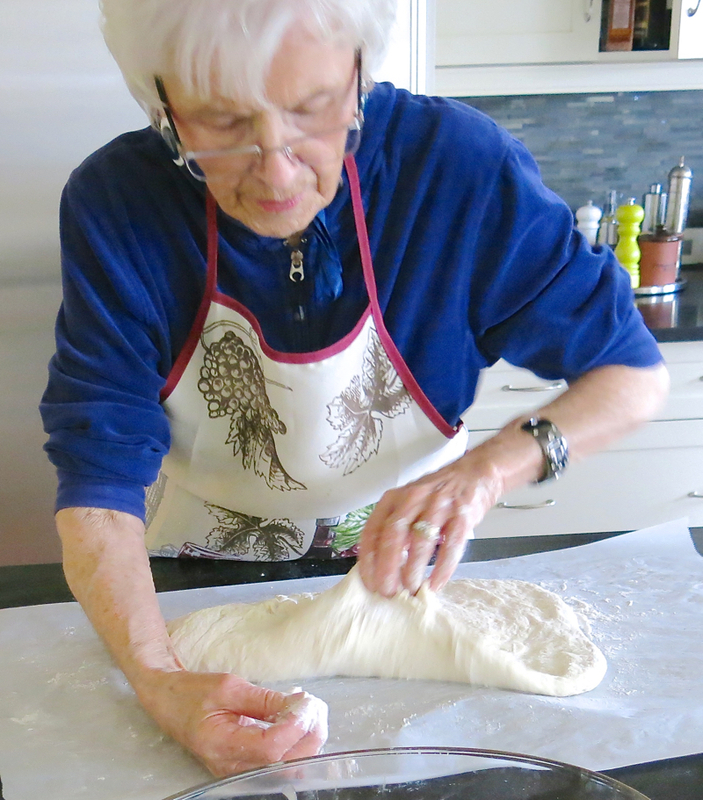 My hands are not strong enough any longer to knead more than two loaves at a time but I do recall the regular bread batch making 12 loaves of bread, four dozen dinner rolls and two pans of something else. 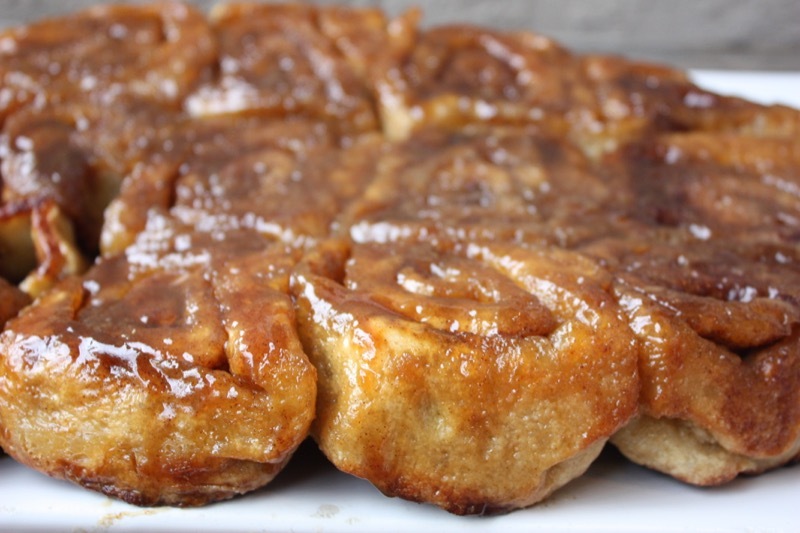 That could be cinnamon buns, pull aparts (also known as Monkey Bread), hot dog or hamburger buns, dad’s wonderful jelly filled doughnuts, whatever he wanted or the menu plans for the week needed. The other day when I was bread baking I started to say, and finger spell, cracked wheat bread? when my sister and brother both said cinnamon buns. Okay, two batches, one for buns and one of cracked wheat bread. My lovely neighbour gives me enough plums from her tree for a dozen jelly jars of plum jam. Another treat from my past: cracked wheat toast with plum jam. One of my dad’s favourites and now one of mine. Those homemade jelly filled donuts have me salivating! 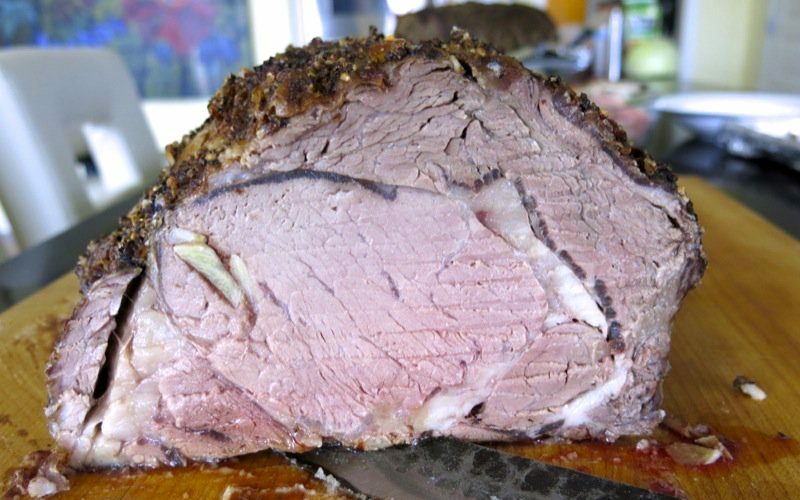 What a great list of homemade food your dad could make! Wowsers! My dad also loved to cook and though he would rather be the guest, he was darn good at it, too. Best fried chicken and wonderfully creative salads. No bread for him though – or baking of any kind! You just made my day! Thrilled to hear this, as mom will be, as well! Thank you, Daniel! Second time ever making cinnamon buns by myself. Entire family loved them! 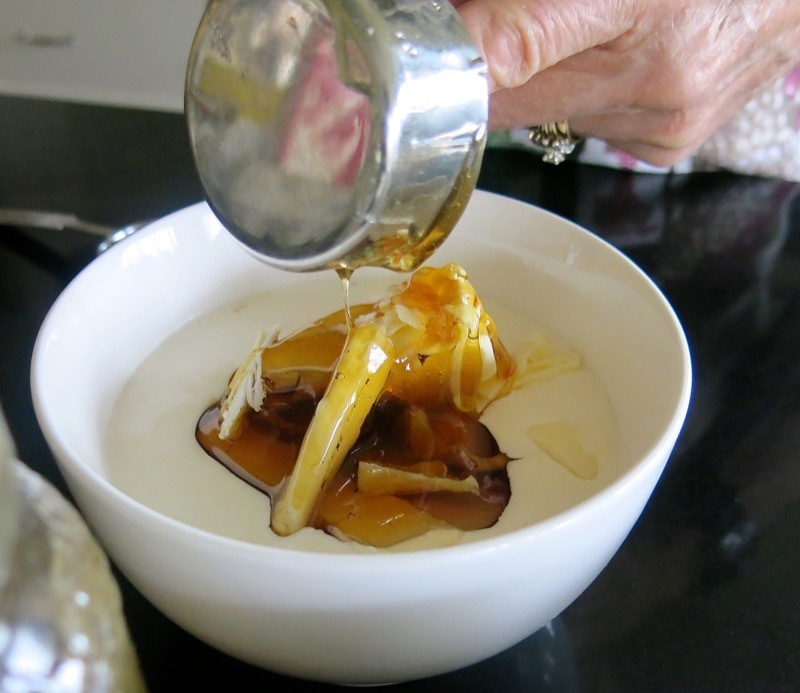 It was three generations of appreciation for this awesome recipe and techniques. You warmed my heart this morning. I am so happy to hear this. Big hug – and hopefully many more cinnamon buns to come for your family in the future! Your mom is adorable! She reminds me of my grandma and I just want to give her a hug!!! 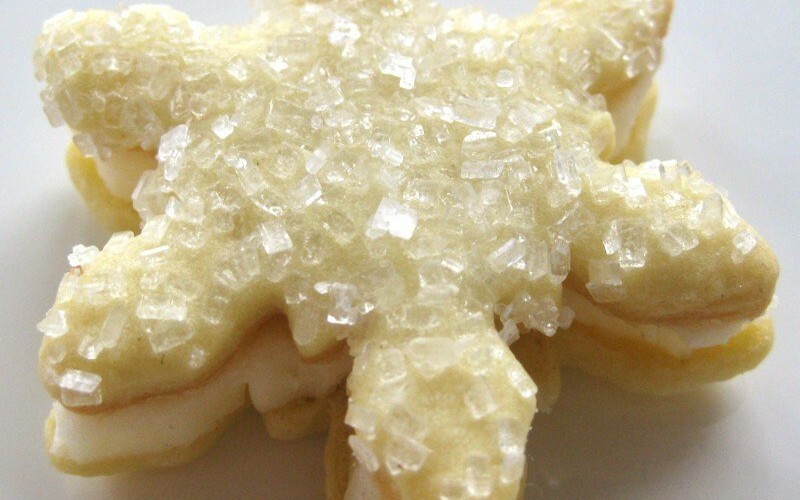 Going to make these this weekend. 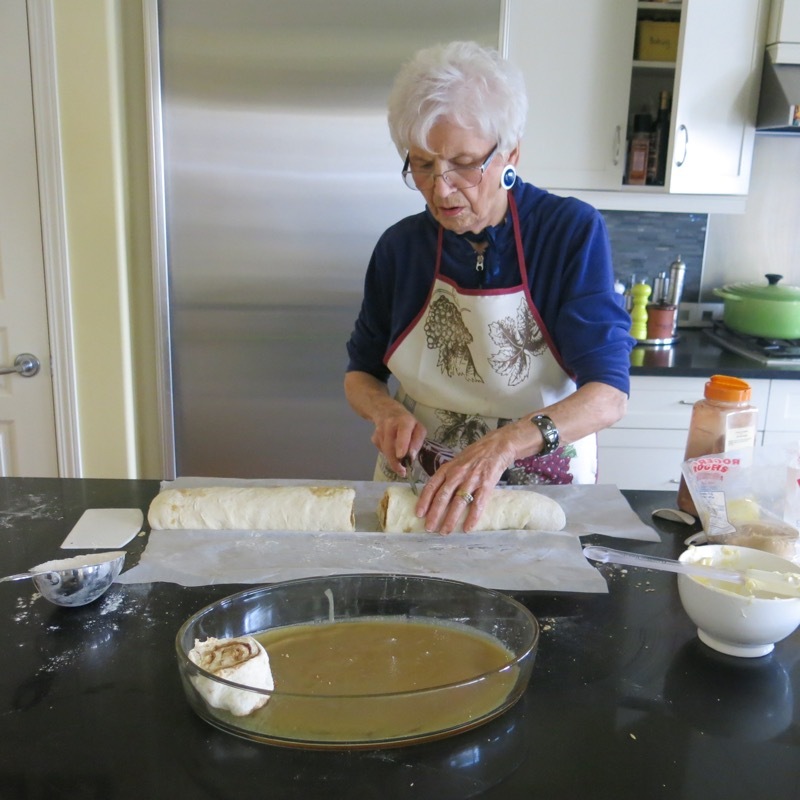 She just made a batch yesterday, Stella, for our Thanksgiving Dinner today – a couple of days early! They are soooo yummy! Let me know how they turn out! Oh. My. Word. THIS is what I’ve been looking for! I usually scroll past the “story,” but I was intrigued by the photos so decided to get the story behind them. LOVED IT! 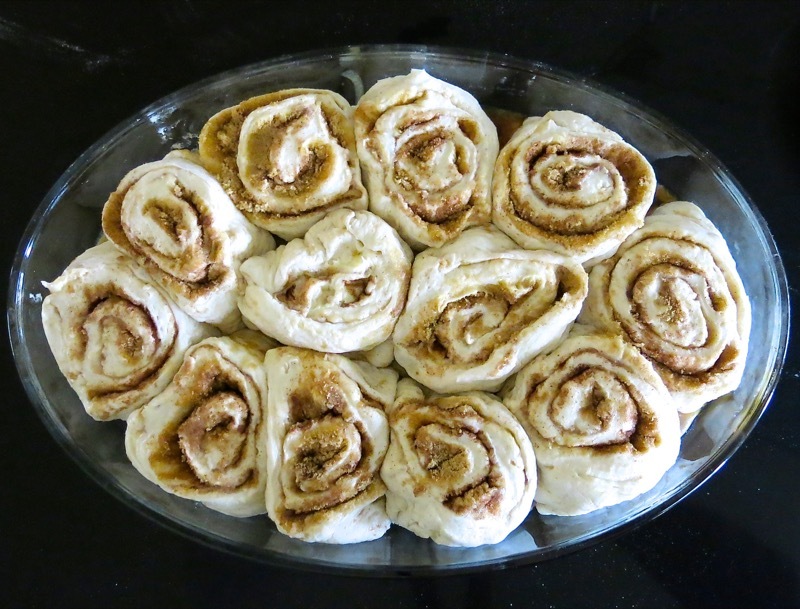 It’s finally getting cool enough here (Kansas) to do some baking, and prep for the holidays, and even though I have a good cinnamon roll recipe, this is more like what I remember eating as a child. I can’t wait to try my hand at them. I’m VERY HAPPY to know they freeze well, too! Your mom is sweet for taking the time to help you get the recipe and instructions. She sounds like me with the measurements. Ha. Southern raised, and it’s shake it until it looks good. 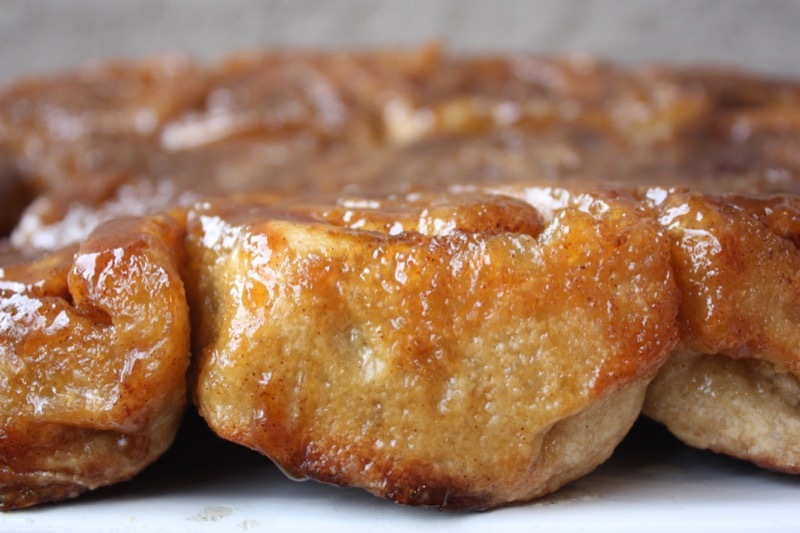 Oh, And, there’s no such thing as too much cinnamon! Oh, this could be dangerous … lol. Beverly – could we be related? HAHA! Thank you for making the time to express your delight with the recipe and the story. Of course, now I am eager to hear whether you really did make them and how the recipe worked for you? So beautiful.I liked the story remindes me on my childhood. Thank you and I wish all the best to your amusing Mom. Puno pozdrava! Let me know if you make this recipe! It might be a bit too sweet for you, but you can always adjust to your own taste! I have been making these for many . Knowing what is in them it takes the desire to eat them away. I use the word goop too and can say I never make it the same way twice. I have found the secret in the goop is the cream, I usually use milk but it keeps the goop layer soft after baking. 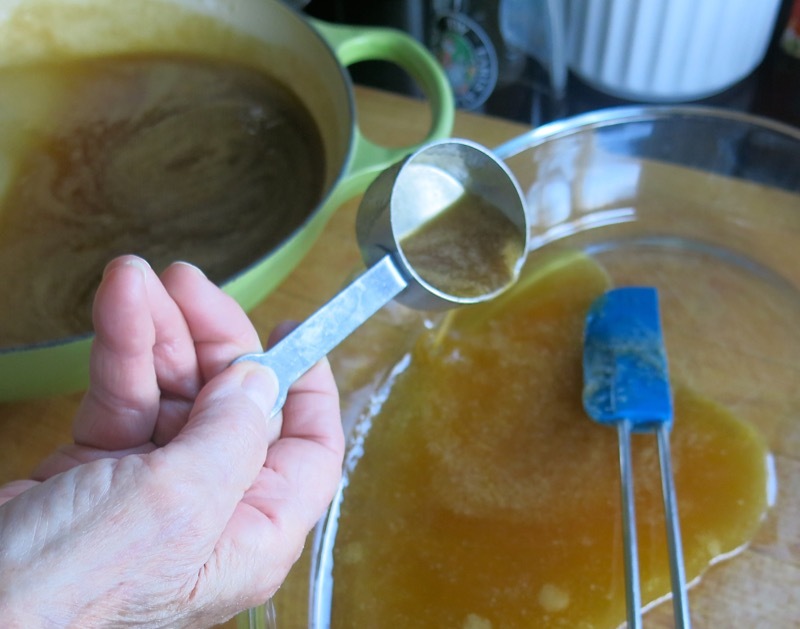 I use corn syrup, maple syrup or honey with the brown sugar and butter. It is a Christmas morning must here. Merry Christmas. Haha! Thanks for chiming in, Carolyn! Isn’t that the truth – but, anything homemade no matter what is in it is better than most of the food we eat these days – which is not homemade and has so many other wicked ingredients in it! 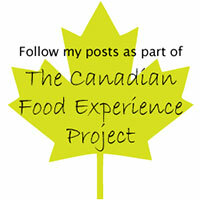 If we could see those foods being made, I am certain we would only eat what we make ourselves! They are in the oven as I type! And, Estelle, how did they turn out? These were ridiculously good! A snowy Sunday here in Canada. Took me about 4 hours with baking time…wasn’t expecting that! But it took about 10 minutes for them to disappear so it must have been worth it. They were almost exactly how my grandma must have made them! The one tip I think I’d give is spread the soft butter all the way before sprinkling the brown sugar/cinnamon mixture…spreading afterwards was a bit messy and gave an uneven spread. I never knew that the “goo” was baked upside down…very interesting! i am going to try these they look so yummy!! i love working with yeast dough. where did you find the glass baking Dishes? i would love to find some like those. So funny! The glass ovals I bought years ago, but saw them just last week at my local superstore! Let me know how it goes! Mom will be thrilled! its’ -46 today on the Saskatchewan and I made these today to warm us up!! They are really good! I wanted to try the bun alone with and than as a cinnamon bun. Both are delicious. my grandma taught me how to make bread when I was 19 and 10 years later I carry on her traditional Ukrainian/ Romanian Kolach bread. 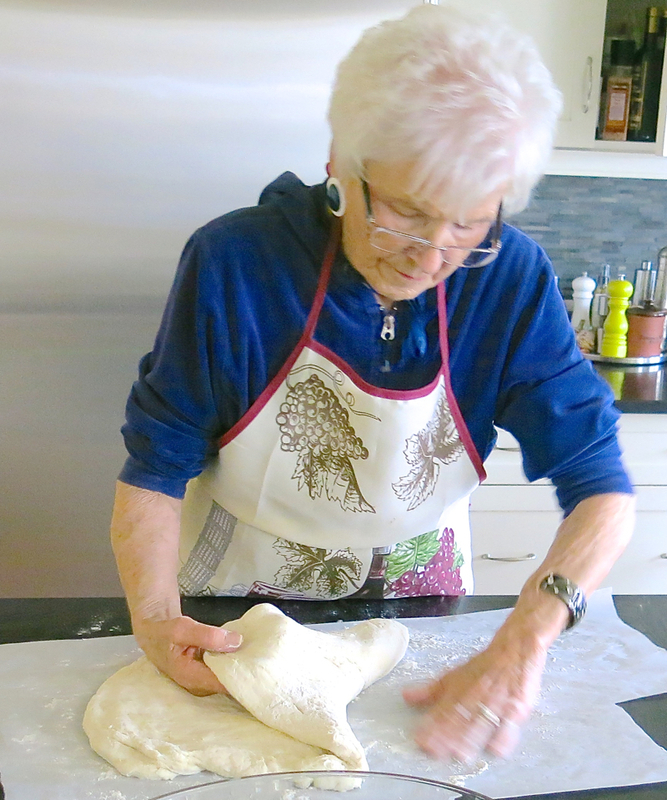 She passed away this summer and I smile every week when i make her bread, she is right beside me kneading away. Aw, Carma, That is so sweet. 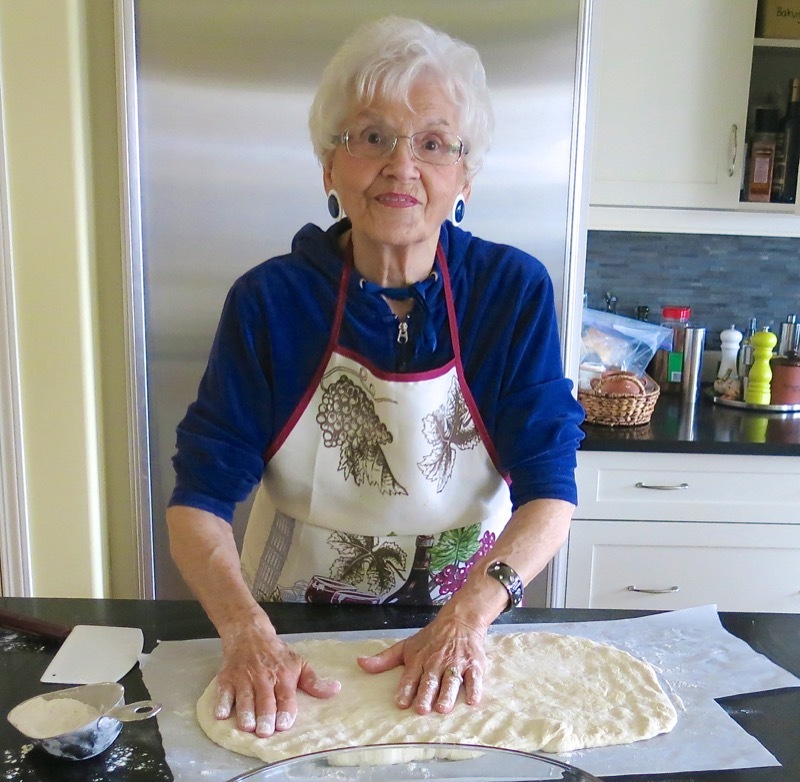 I remember my Grandma, Maude, so many times when I bake or pick berries, as well. 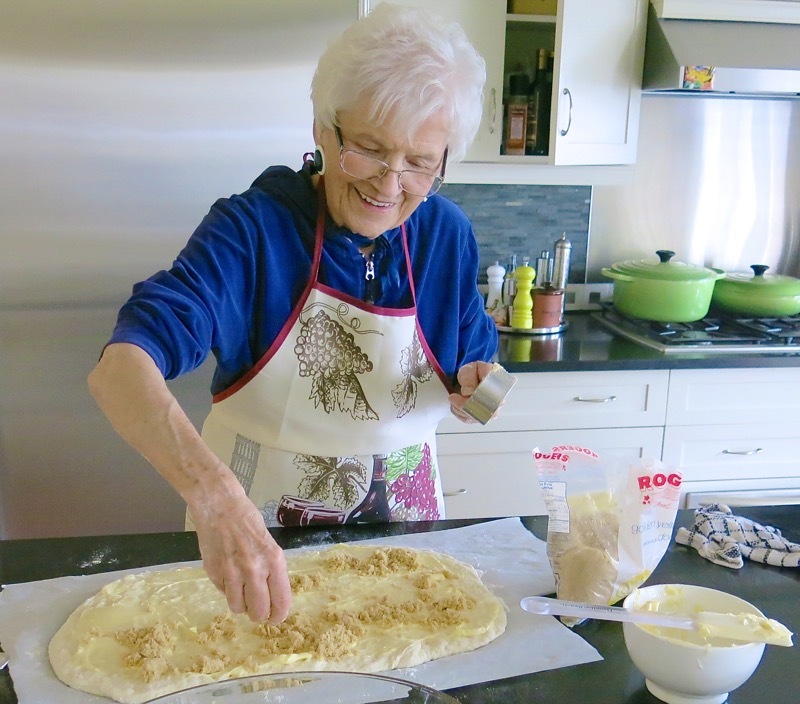 Big hug to you – mom will be tickled you enjoyed her recipe and I am very grateful you took the time to tell us. 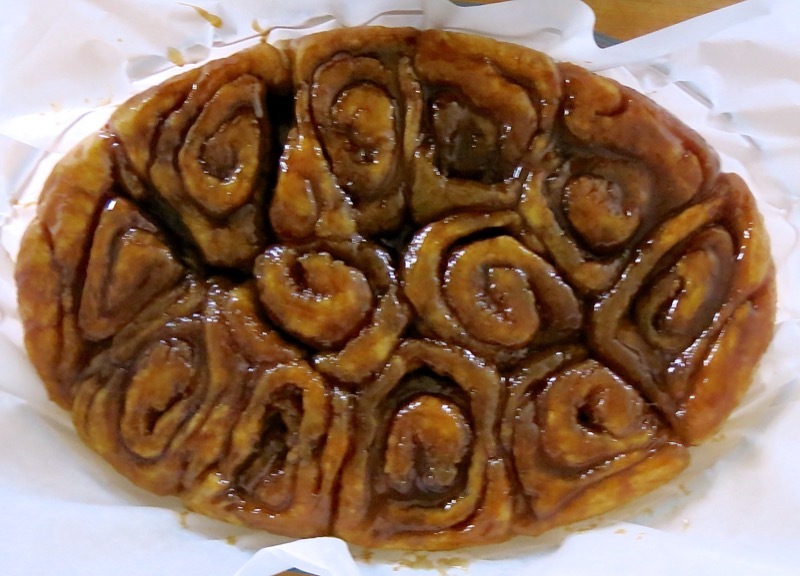 BEST CINNAMON BUNS EVER! 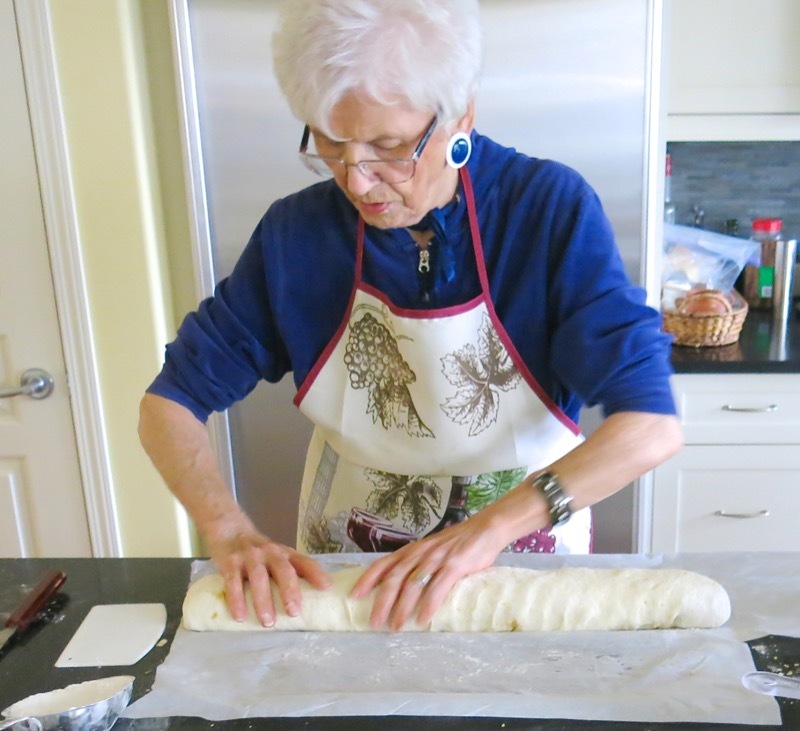 I started by making your mom’s prairie bun recipe and proofing the dough overnight. I could tell when I was kneading that it was turning into a beautiful dough. This morning I cooked the goo and got everything ready while the dough was warming up to room temp, then assembled. I followed both recipes to a T except subbed maple syrup for honey/corn syrup in the goo. Then I blundered (hey, the sun wasn’t even up yet!) and rolled the dough way too thick, cut the buns too large and ended up with 8 massive buns in a deep 5 quart baking dish that took well over an hour to bake. I had to cover with foil after 1/2 hr and use a thermometer to check doneness. But all is well that ends well because they were absolutely delicious! 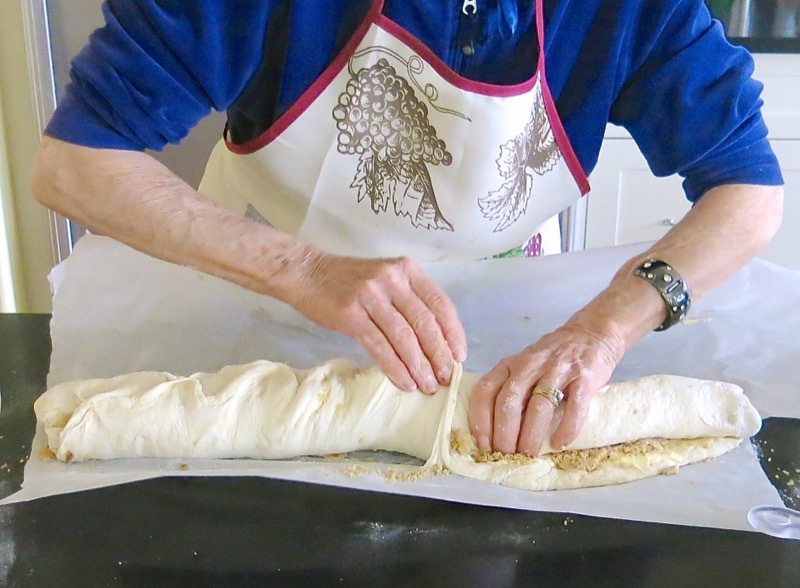 Next time, I’ll roll the dough a lot thinner and follow your mom’s advice more closely and I’ll try her parchment trick to get a tighter roll. Please tell her thank you for sharing her recipes. The dough was marvelous, light and fluffy! It will be my new bun dough recipe for plain and savoury rolls too! Mom will be thrilled. Great story, Liz! Thank you so very much for sharing. I enjoyed the read this morning with my coffee – though it wasn’t as early as your morning! Cinnamon buns, round 2. This time, I rolled the dough to what I thought was thin enough and it looked to me to be about the same size as your mom’s dough. I was careful with the dough to keep as much air as possible as your mom suggested. 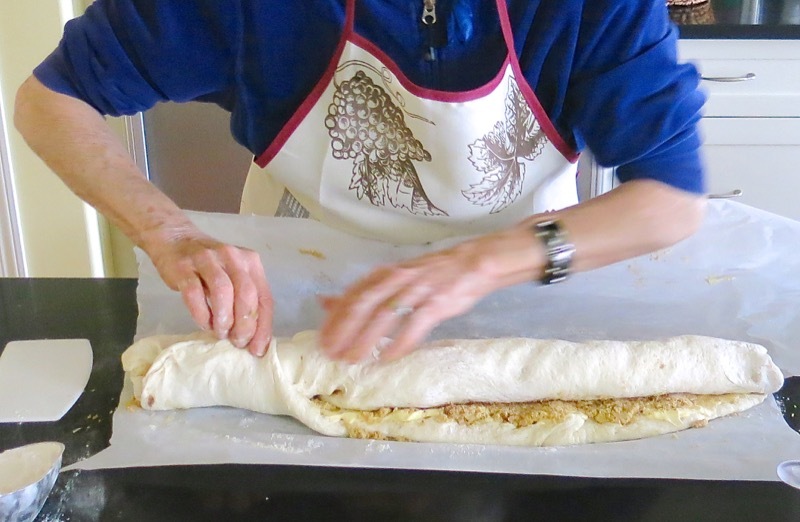 I have a pastry mat with cm and inches and was careful to cut 1″ slices. I still ended up with 8 massively round buns for the goo in a glass pyrex exactly like the one you use (a thrift store score!) and then had enough to put a further 7 buns in another slightly smaller pyrex dish which I think I’ll ice with some cream cheese frosting. I food-binned the 2 ends too! Honestly, your mom would have a good laugh if she could see my efforts! I can’t figure what I’m doing wrong. Probably not tight enough? Not rolled thin enough? I have no doubt they will taste amazing so I’m not terribly disappointed but I’m a bit of a perfectionist so I really want to get this right. 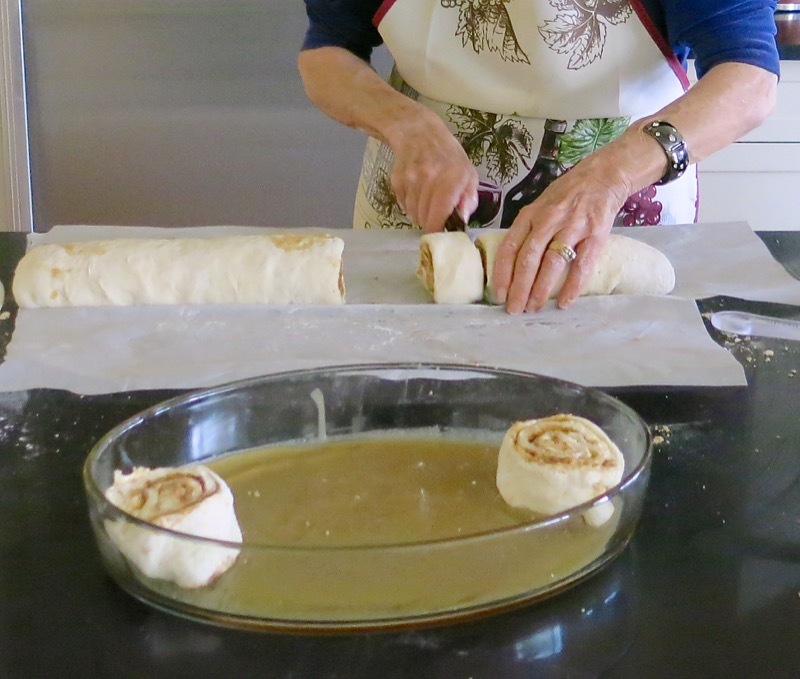 My dear mother in law used to make the most amazing cinnamon buns and though I took the time to watch her make many things (just like you, I had to take copious notes! ), I was busy raising a family and working full time in a demanding career and never bothered to watch the cinnamon bun process. I regret that now! Anyways, any advice would be appreciated. Thanks again, really enjoy your website. 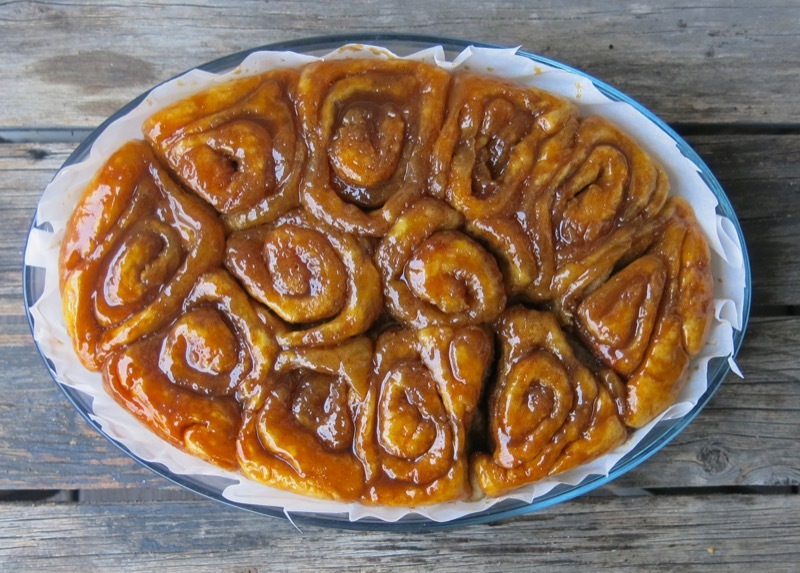 My husband has vivid and fond memories of the cinnamon buns his aunt made on the farm north of Calgary where he spent his summers. I have tried to recreate what he describes – without much success. Perhaps it is not possible to recreate a memory which is composed not just of remembered tastes and scents but also of the place, people and feelings that go along with them. Having said that, these seem so much like what he describes and remembers that I am going to give them try. Even if they do not live up to his childhood memories, they will be enjoyed. Thank you. Let me know how it goes, Marla! 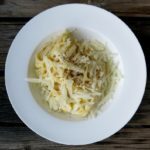 We love this recipe at our house! 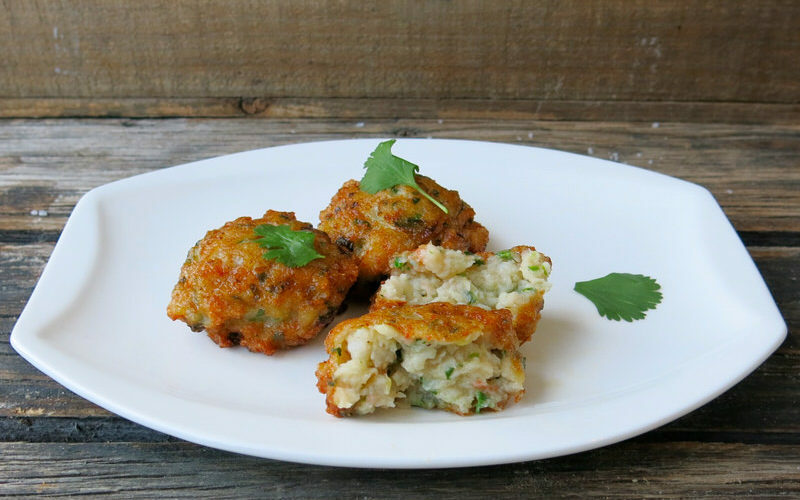 Tickled you are motivated to try the recipe and am pretty sure you’ll love it as much as we do! Valerie, I loved this blog post. And your mother is so beautiful. It warms my heart knowing the love and experiences you two have shared. I’m going to try this recipe for certain. There’s obviously magic in the love behind the making of these. 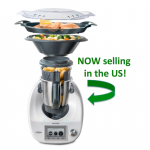 I would love to hear how the recipe works for you! 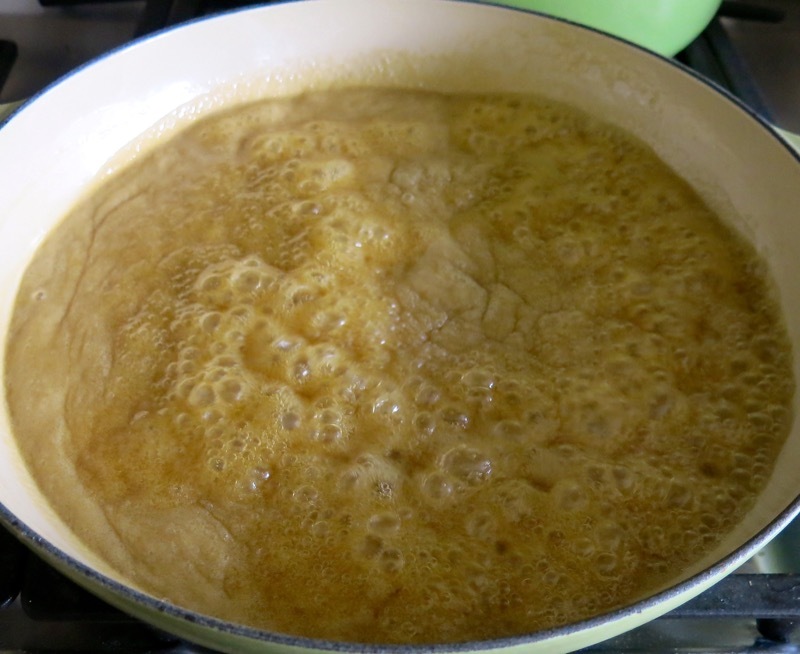 Do you use a le creuset pan to make the goo? 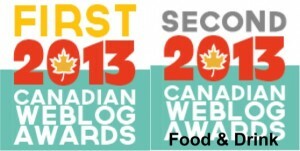 ( it’s green) also looking for oval Pyrex in Canada. Bb and beyond has the 9.5 x 11. Would that work? No need to have the oval pyrex, but I got it from Superstore years and years ago. We actually made 4 batches the day I took the photos and this one had the nicest look so it is in the photo. I have always had a bit of a fetish for gorgous and unique glassware and serving dishes and this one was really unique in “the old days”. I saw them very recently at Superstore, again! The size would be equivalent to a 12×15 pan so the Bed Bath and Beyond one is smaller. I likely used the green creuset braising pan to make my goo. I love them both and use them for everything. Have fun making these! Let me know how it goes! Made these buns and shared one with everyone on my floor in our apt building, got nothing but RAVE reviews, now my sister wants me to make her a batch. Can you use diabetic sugar for the filling? Also these freeze extremely well. My favorite recipe. So happy to hear this, Linda! Thank you for letting me know. I don’t know the answer to your question about diabetic sugar. 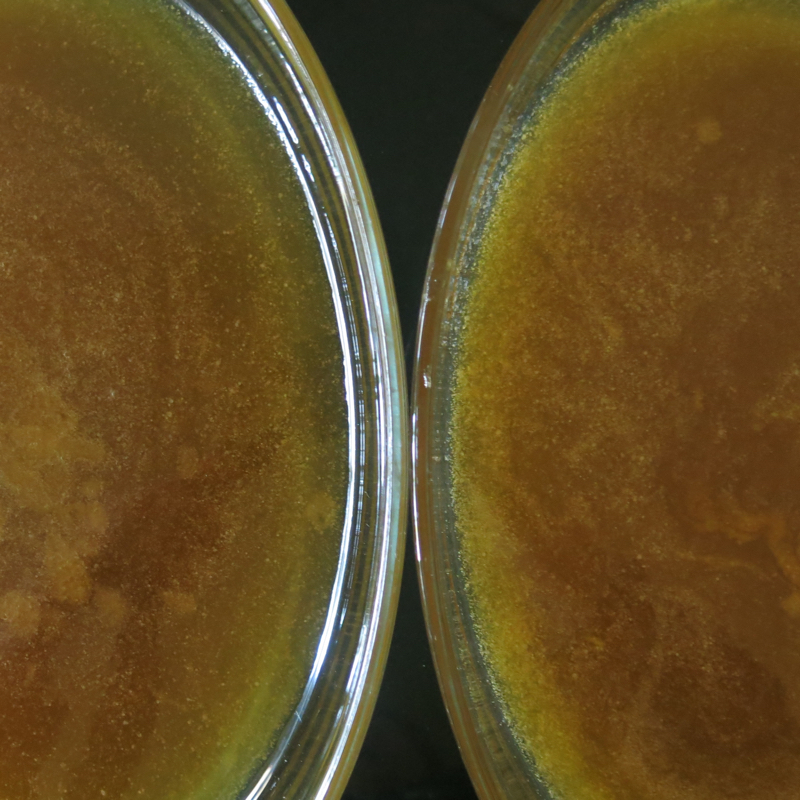 I imagine you could use Brown Sugar Swerve, but the results would be significantly different. Hands down the best cinnamon buns I have ever made. Thank you so much for sharing the detailed recipe. I live in Manitoba so could not resist trying a recipe from a Canadian prairie baker! So fantastic to hear this! Mom will be tickled and so am I! Nothing like a family favourite coming from the Canadian prairies where we all call home!